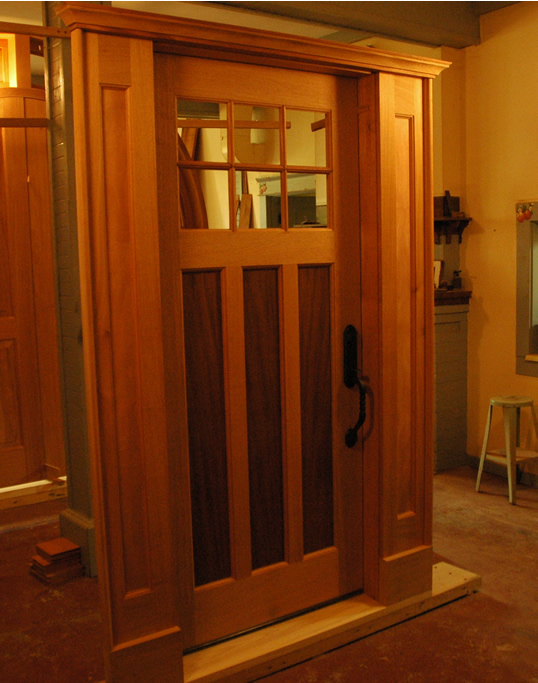 We love making doors at The Wooden Window & Door Co.! 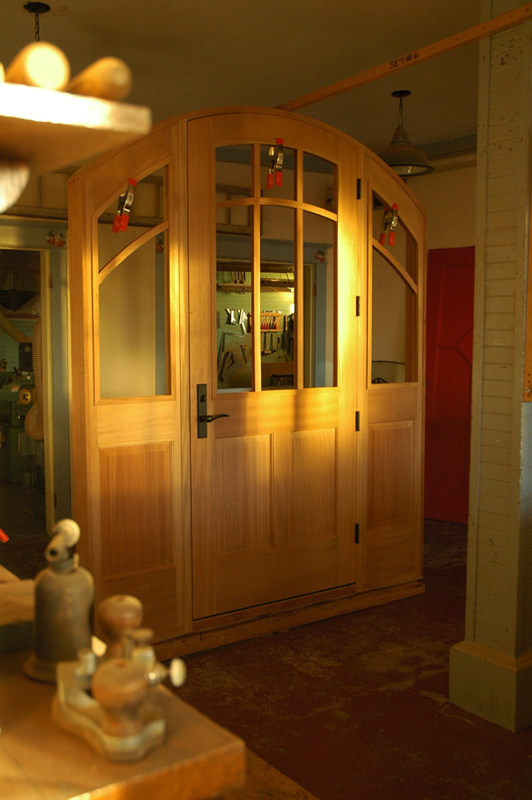 It is mostly because requests for doors usually come from customers who by nature are quite eccentric, thus, the door is reflective of this eccentricity. We have a lot of fun here when the creativity component is alive. 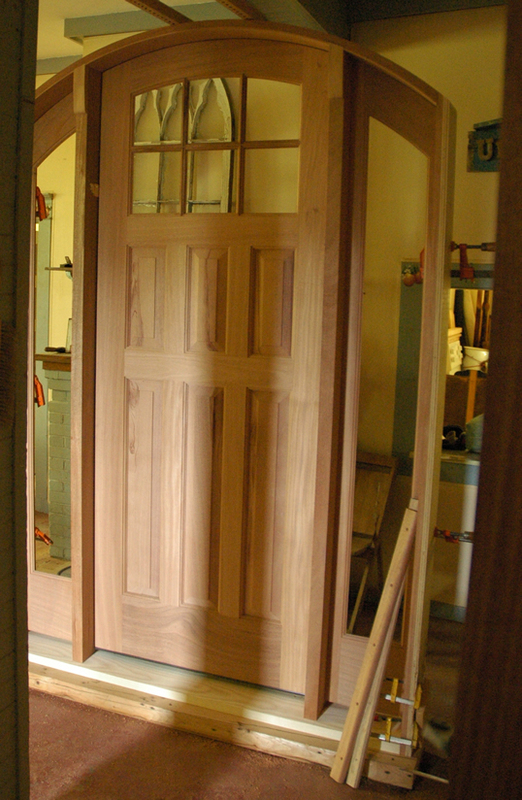 That being said, we can make any style of interior or exterior door. 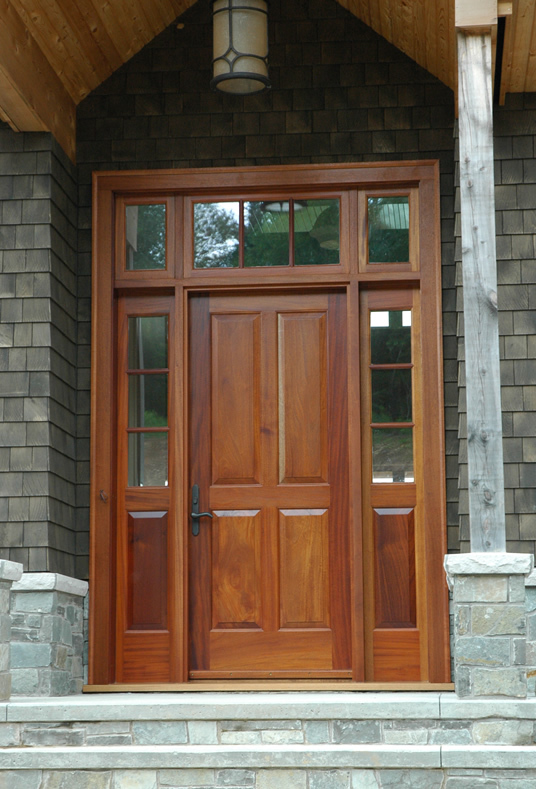 Our exterior doors usually run between 1-3/4 to 2-1/4 thick! 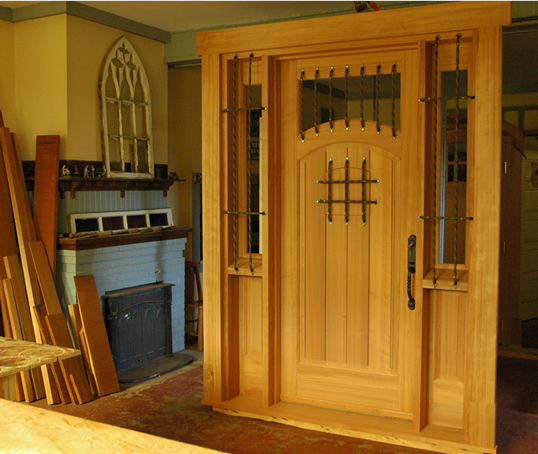 Below you can view just some of our entrance systems and doors - everything you see on this page was made exclusively by us from scratch in our own shop in Woodville, NS. 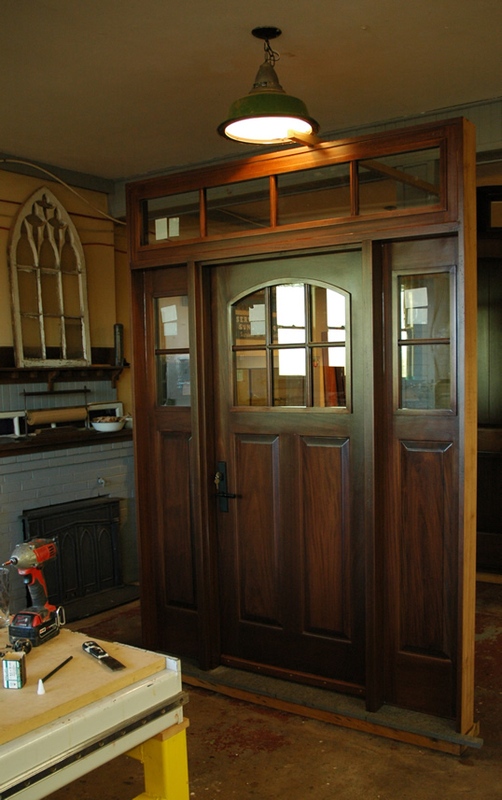 Colonial styling in mahogany... going to New Brunswick. 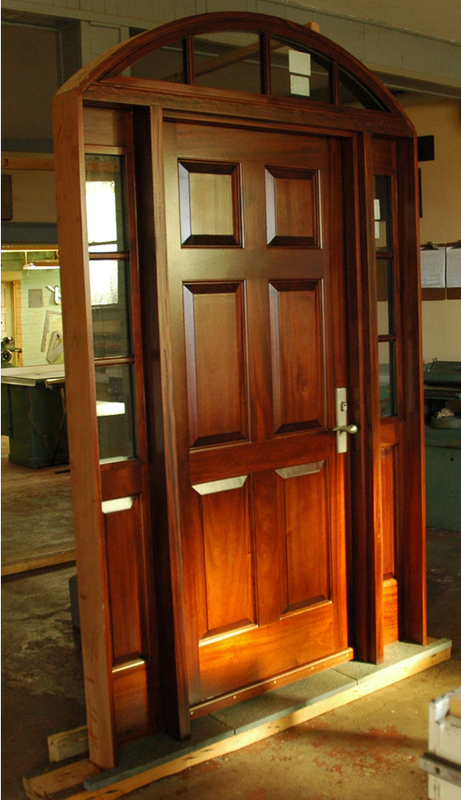 Mahogany side door with minimalist-traditional styling. 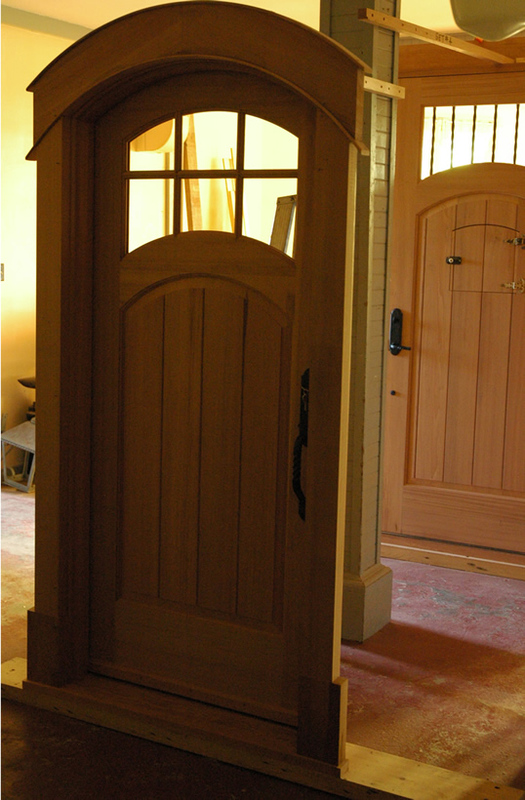 Single doors with transoms can be nice! This one was well seen. 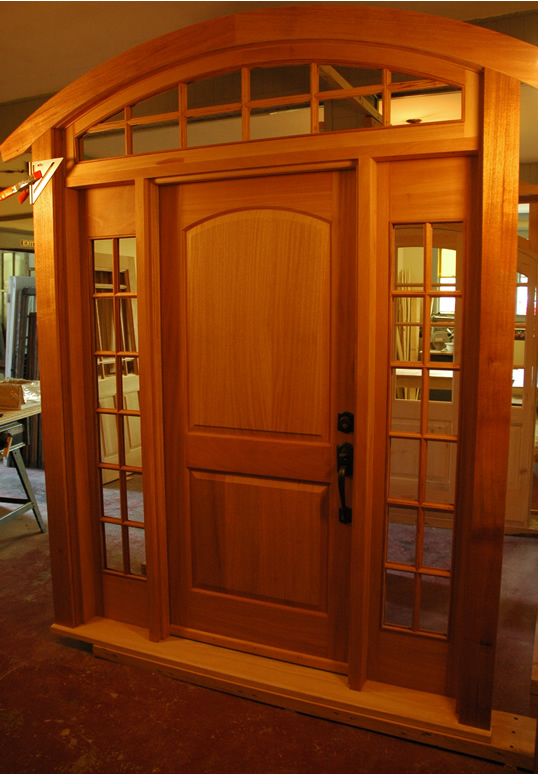 A nicely designed mahogany entrance system going to New Brunswick for our friends at Craftsman Construction. This one will get art glass for both decoration and privacy. 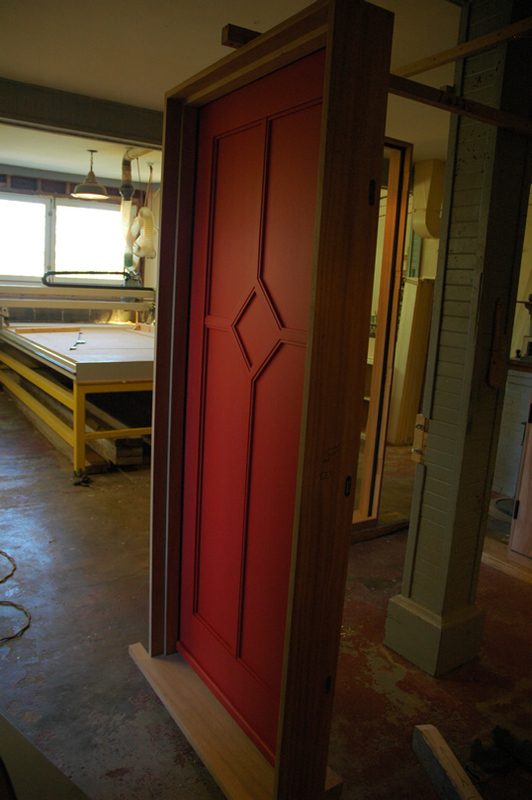 If there's a nicer set of carriage house doors out there... we haven't seen them. 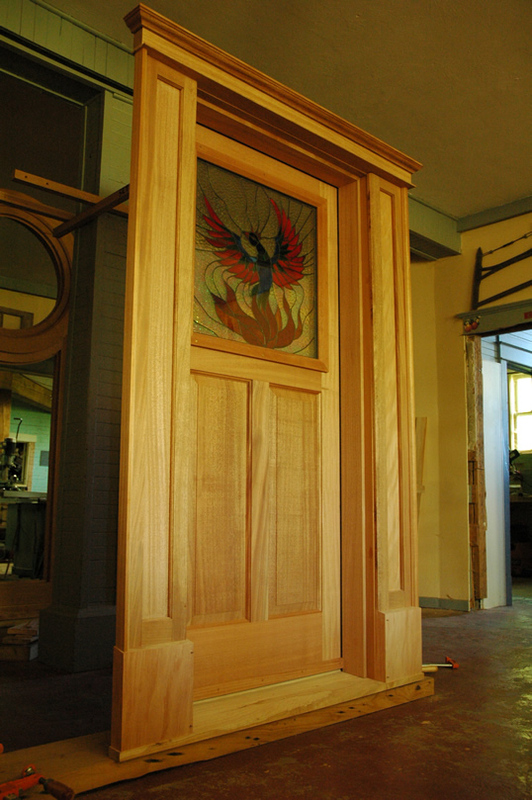 A massive, 12' high oak entrance we built for the Brydon family. Welcome back to NS guys and I hope you will be very happy in your new home. 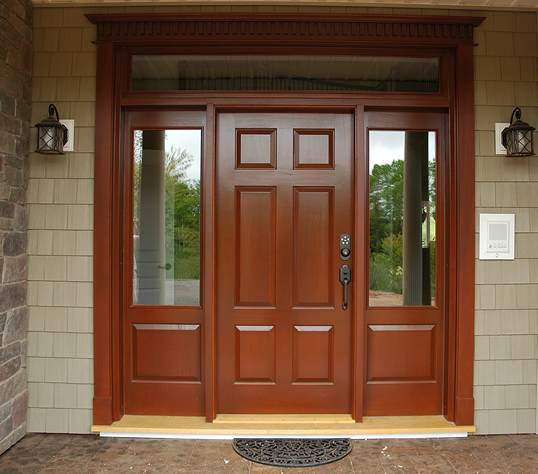 Another lovely mahogany entrance we built for Pinehurst Homes iin Fall River. Thanks Todd. This tasteful example we shipped to Calgary, Alberta. 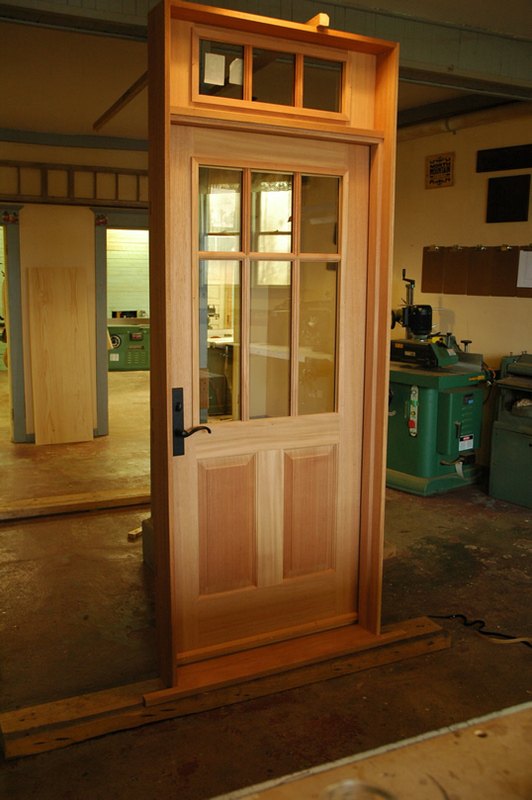 A traditional craftsman with a cleanly integrated transom. 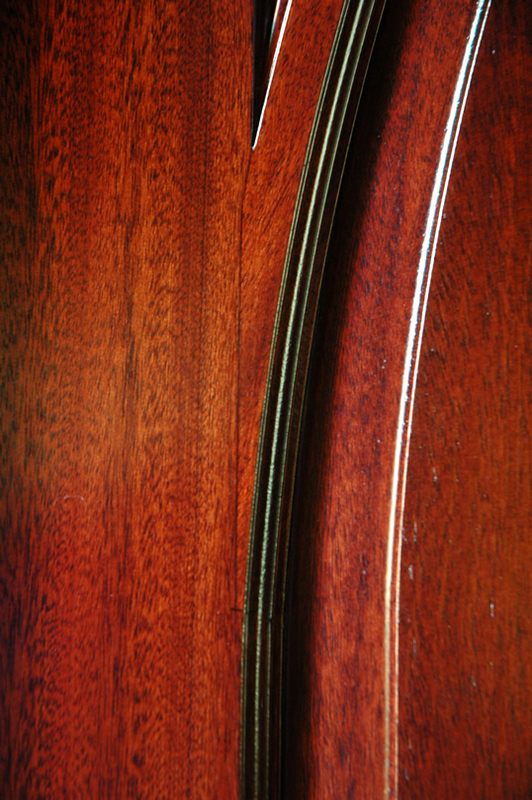 I often forget how nice natural finished mahogany actually is... This one went to Wolfville, NS. 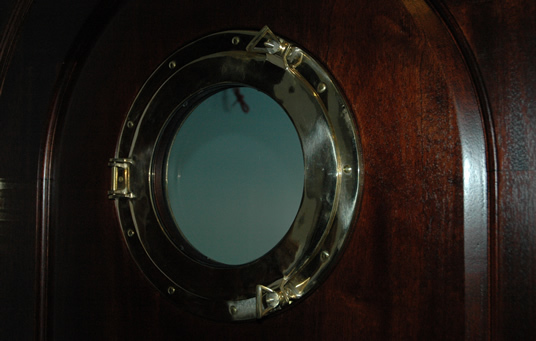 Colonial with an impossibly shallow eyebrow transom. 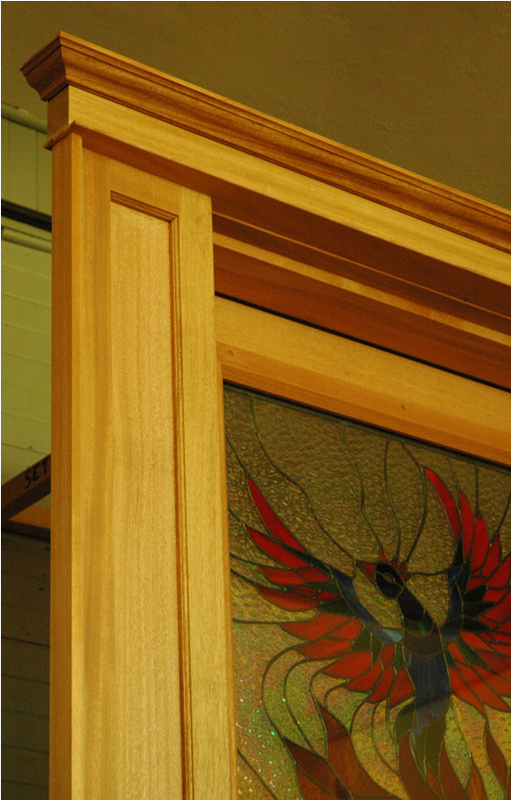 If there is one thing I want to convey from the above 3 images to potential customers whom want a transom but don't really have the height in their plan - we can probably pull it off for you. We are probably the only people who can make this type of product possible. 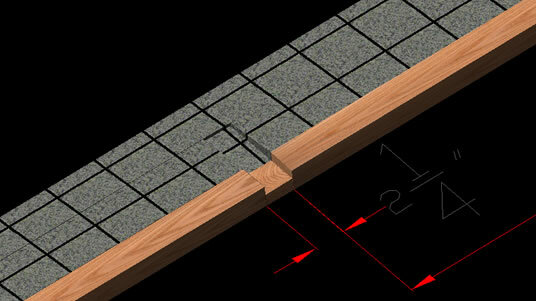 I include the detail of the bottommost image to illustrate how efficient and clean our designs are. 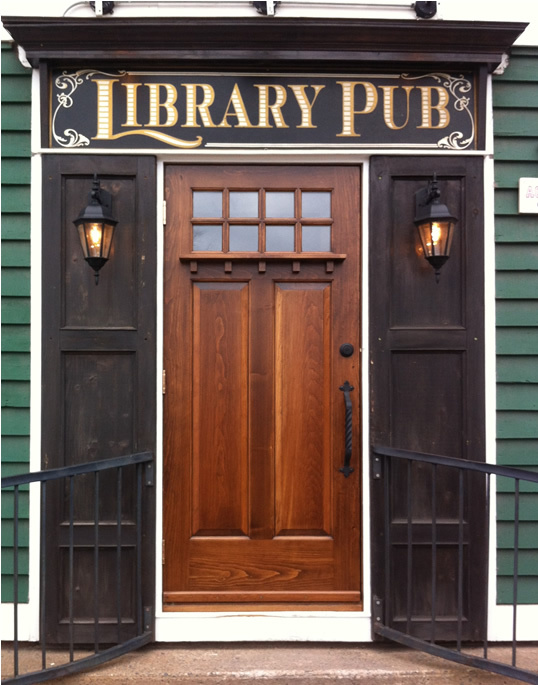 To tuly appreciate this entrance one really needs to see it installed and with trim affixed. Here its a bit like a picture without a frame. 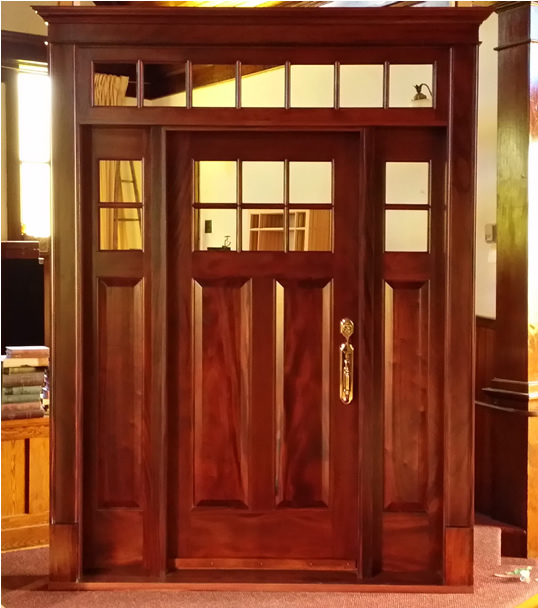 An shaker style arts and crafts African mahogany entrance finished natural with clear coat only. 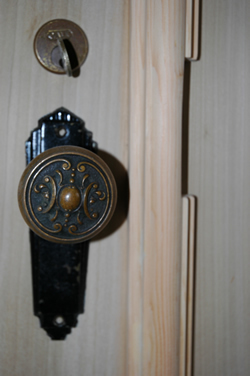 This one has a dentil shelf and a 3-point multipoint lockset. This one is going to Charlottetown PEI. 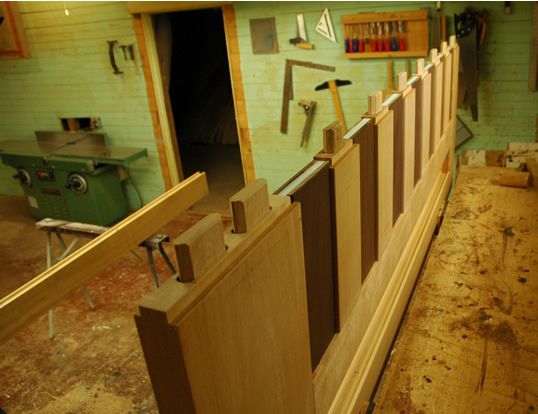 Keep in mind this is not simply a carved out panel from one piece of glued-up mahogany - these are all floating panels housed in stick-cope joinery. Also, all the raised panels here are single boards - we have an inventory of extra wide stock which allows us to give our customers the best of quality. 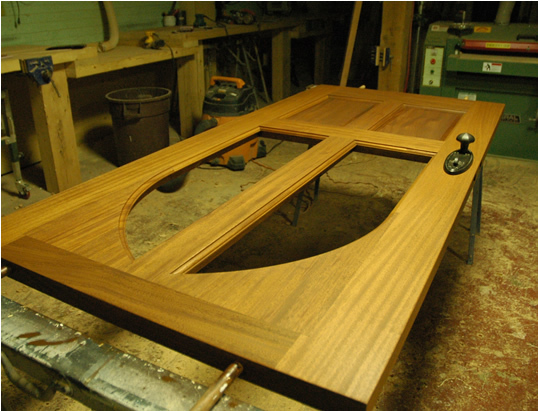 An all-mahogany entrance going to Middle Musquodoboit. 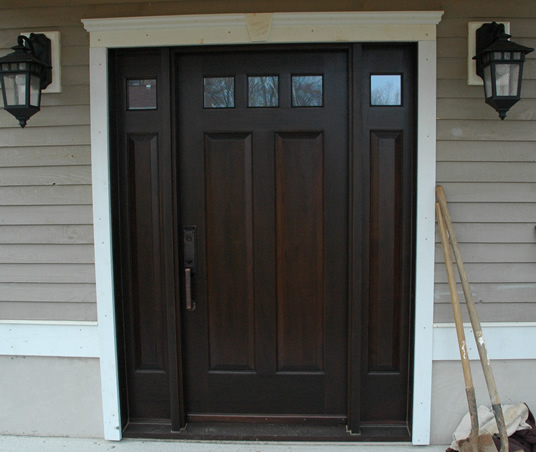 This customer had a photo of an entrance that they simply had to have for their new home and replica's are our specialty. 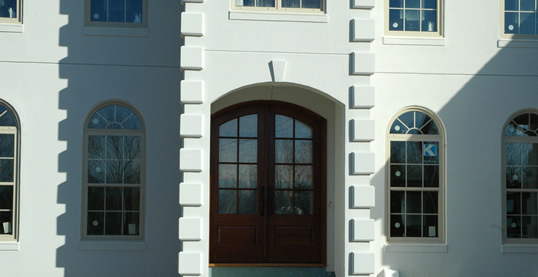 We did matching interior and exterior trim kits that are quite striking in design. Thank you Laura and Seth. One of our more classic designs. 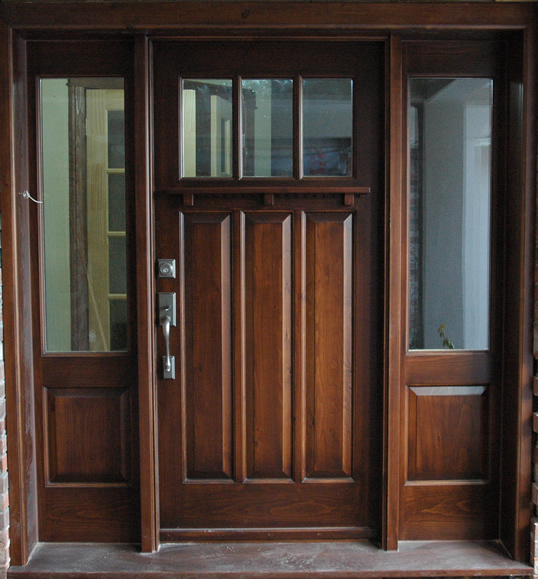 We fitted this mahogany entrance with a granite sill and a Gretsch-Unitas multipoint lockset and lever trim. We met up with an old friend whom did the install - thank you Mr. Pat Farrell for making us look good! 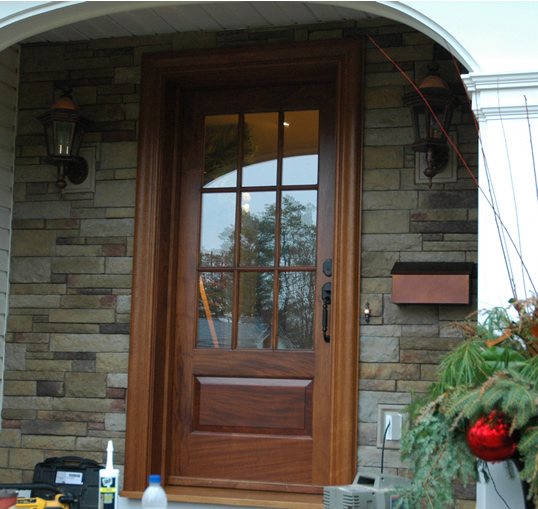 We built this mahogany entrance for a couple in Kingston, NS who wanted something traditional and organic. A nice result. 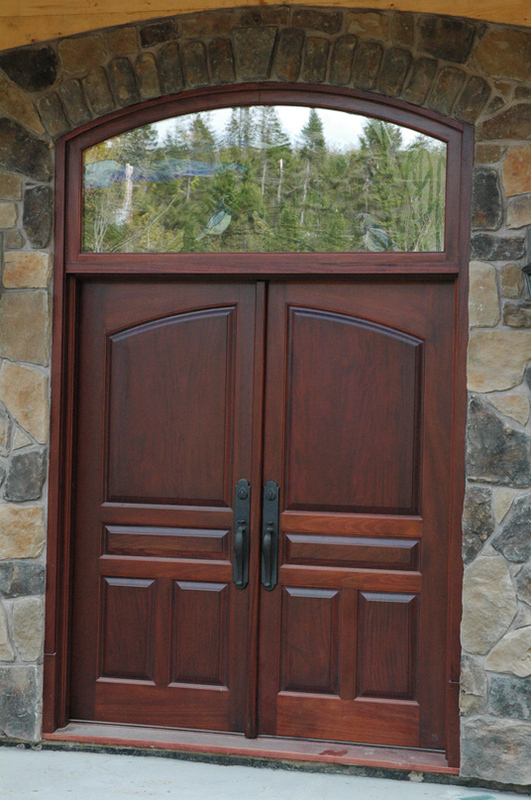 This mahogany entrance we built for a customer on the South Shore has a few defining features worth noting. We are now offering stone/granite sills for our entrance systems - you can see in the second pic from the top just how seamlessly our sill melts into the rest of the stone. 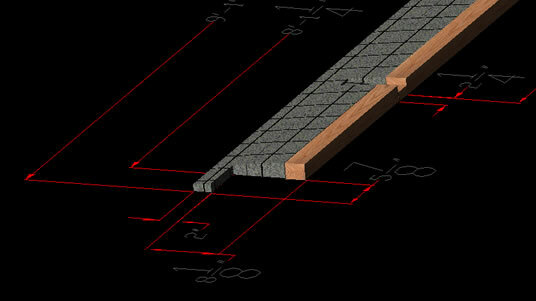 We've added our shop drawings here as well for future reference with our designer/architect contacts... 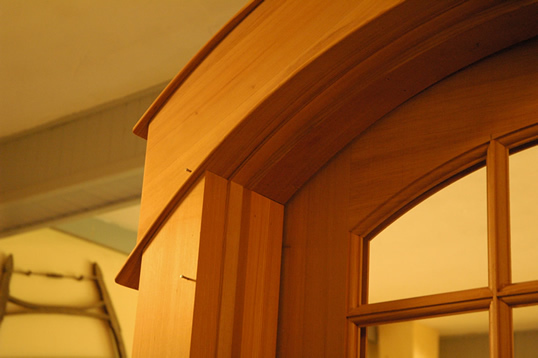 The other point of interest are the large bolection raised moldings. These are old-school size and although my picture doesn't show it very well, the same molding is continued over to the sidelites. 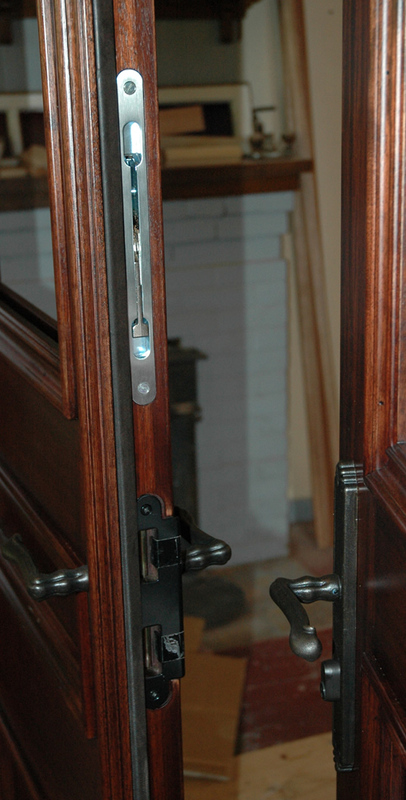 With these bolection moldings both on the interior and exterior, this door is over 4" thick at its widest points. Two entrance systems we built for Bentley Built Homes The top photo is a standard 80" entrance and the bottom is an oversize 96". This is a fresh, clean design with a narrow string of cobalt blue lights atop. Thanks John and Denise! 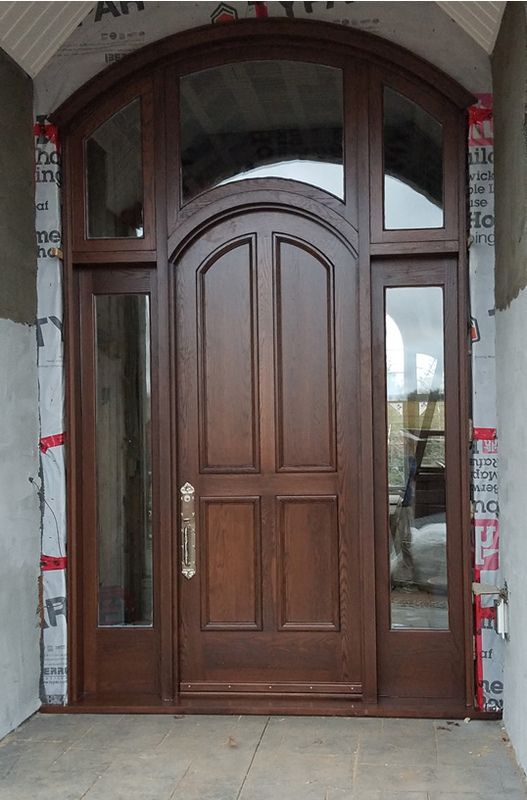 Here we have a finished mahogany arch top door with a tastefully placed transom. 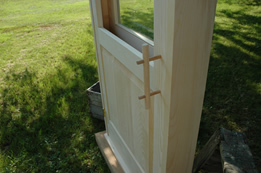 This jamb depth is about 13" and designed to seamlessly fit into an ICF insulated home. This one is going to Fall River, NS. 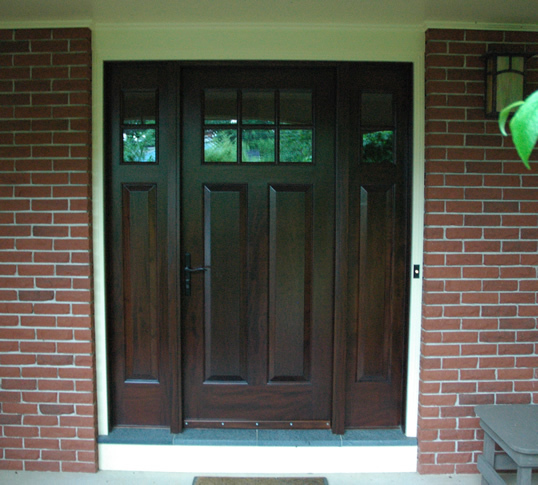 A stately mahogany entrance completed fully in mahogany with a lighter mahogany stain. 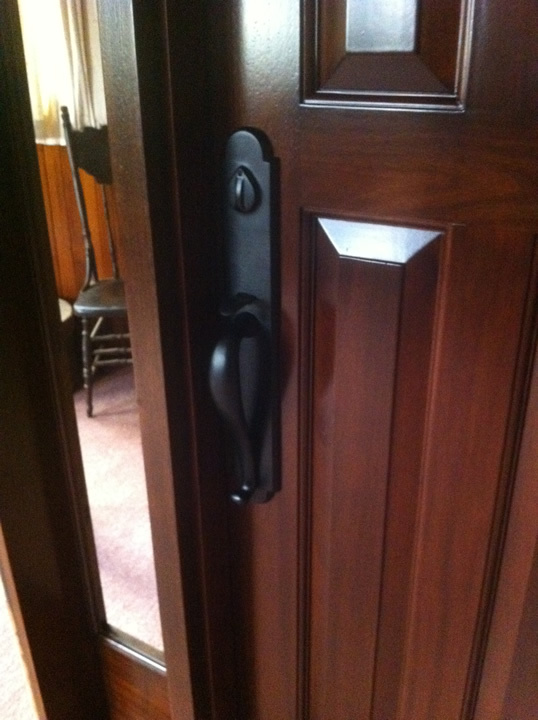 Both lockset and hinges are oil rubbed bronze. A very cool wine cellar door we just finished. 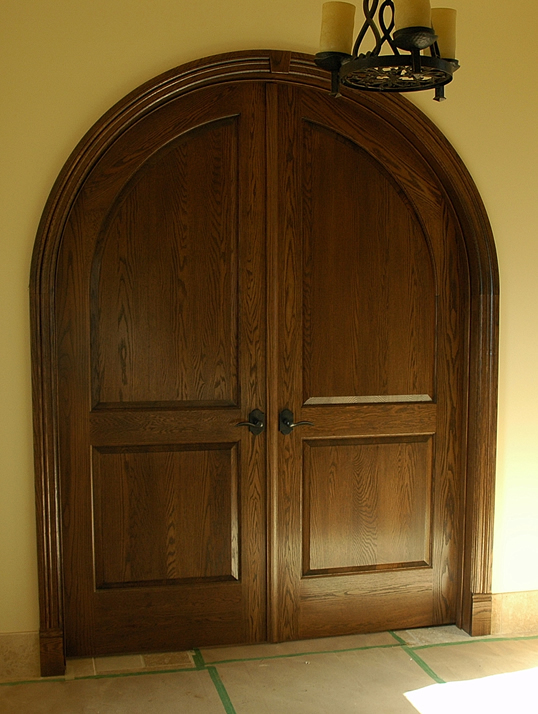 This customer takes his wines quite seriously and indeed how nice it will be passing through this heavy dungeon style mahogany door with hand forged round clavos installed. 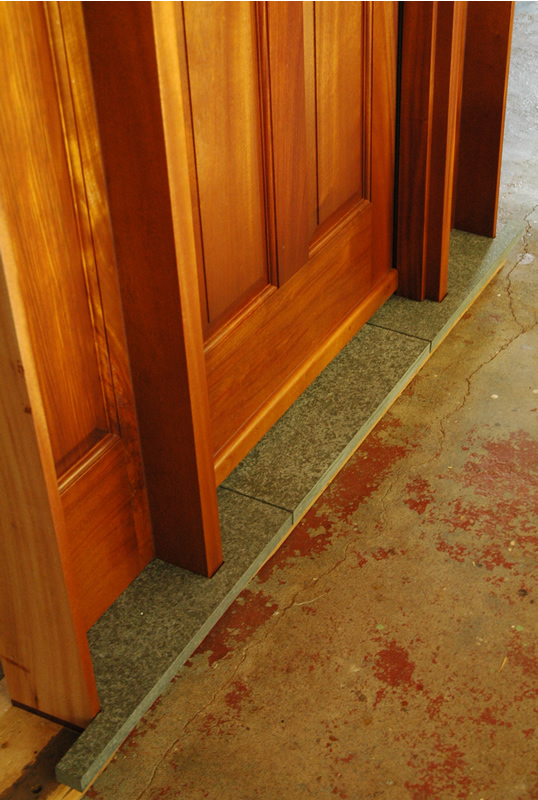 This wine cellar door has a matching mahogany jamb that is fully weatherstripped to keep the temperature and humidity just right within the wine cellar. This piece is being crated and shipped to New Brunswick. 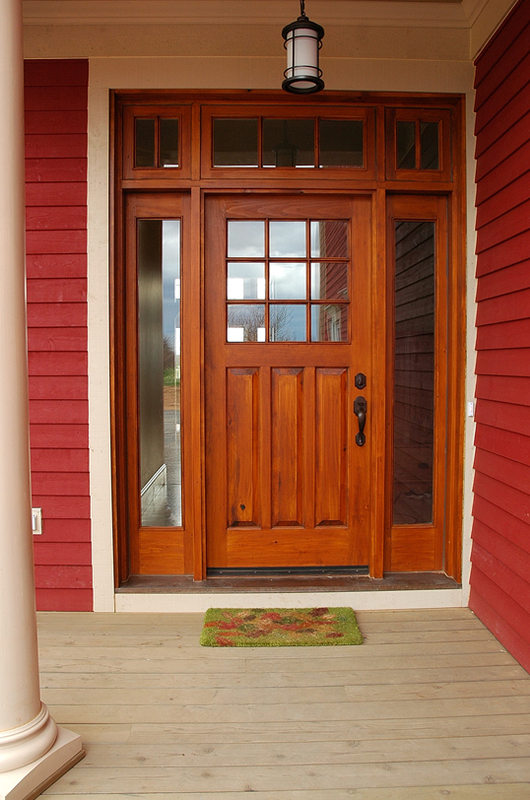 A mahogany entrance we built for a family in Windsor, NS. 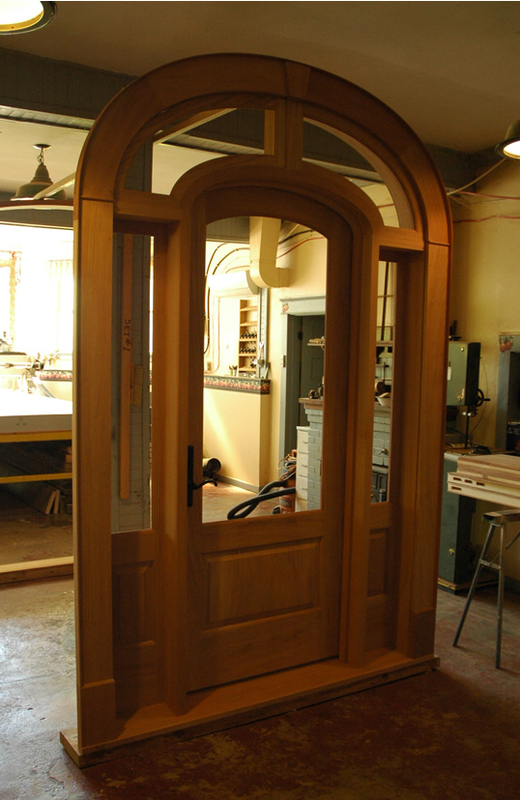 A generously paneled African mahogany entry going to Toronto. 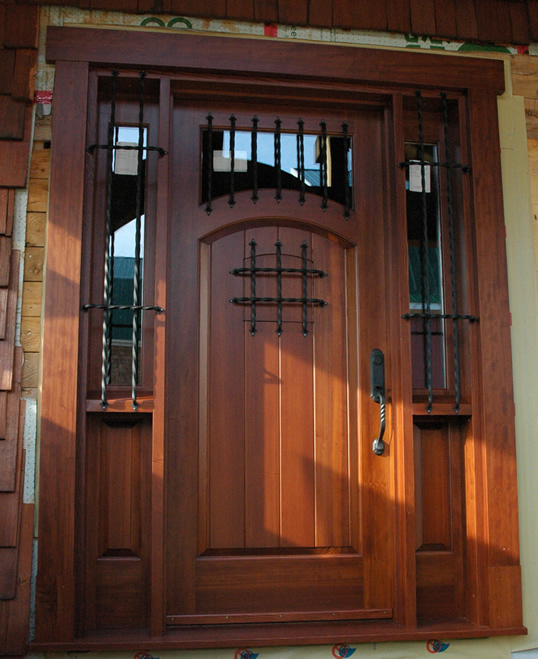 Long, elegant hardware meshing with a long (8 foot) door provides a tall feel for this entrance. 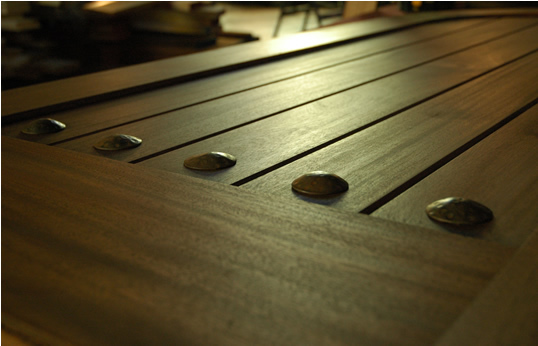 Dark walnut stain here. 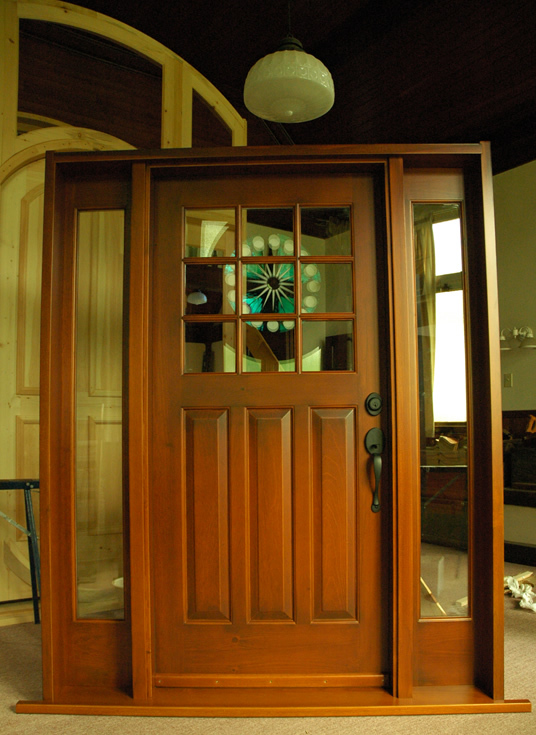 An African mahogany shaker style entrance. 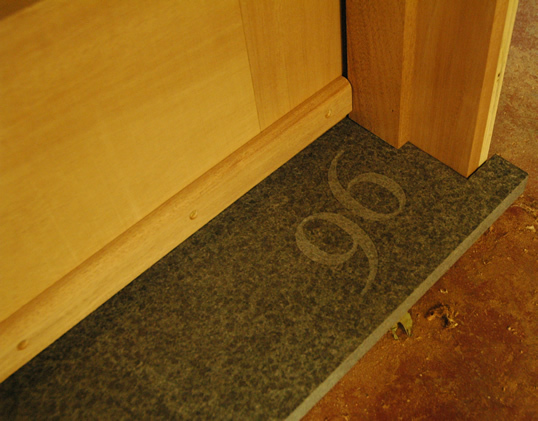 Every cut and profile on this entrance system is at 90 degrees. 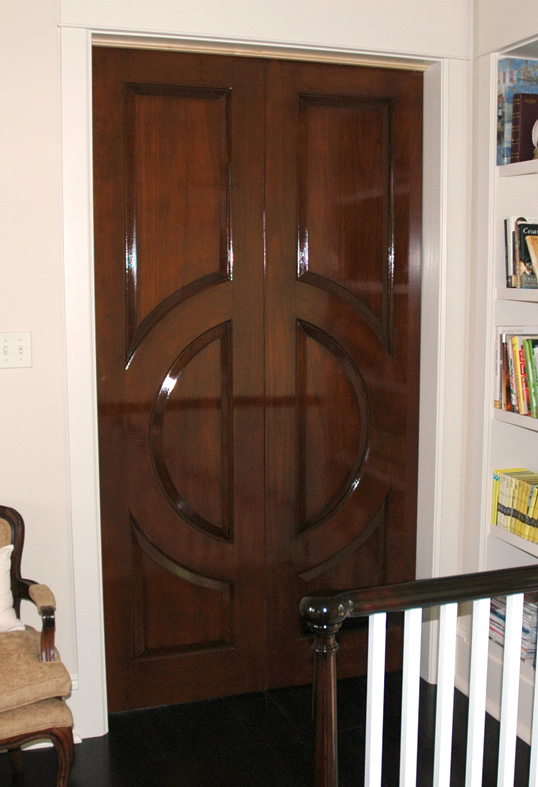 A gothic style mahogany entry door we just finished. 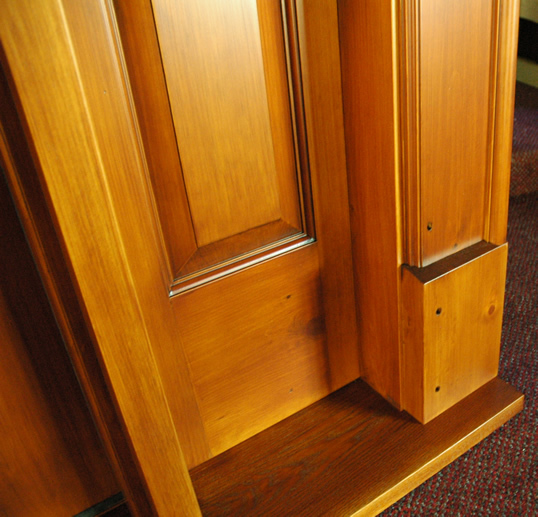 Very tight and attractive joinery here. 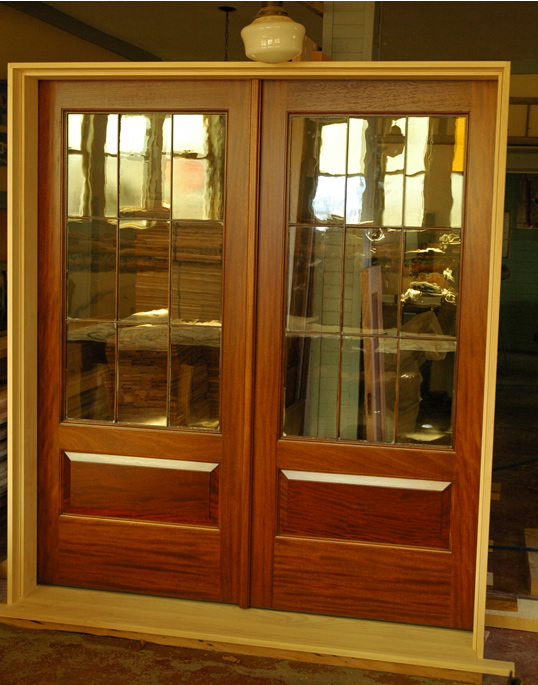 For all the historic architectural purists out there, here we have a set of garden doors in ribbon mahogany and ancient glass very high in distortion. The defining feature of this set however are the impossibly narrow 5/8" wide muntin which truely divide this amazing glass. Thin muntins are the ultimate in elegance... This is rare work. Hard to say anything about this project other than it's outcome was simply perfect and I met some very nice people in the process... Happy holidays Jen and Les and thanks for your business. This is also a good time to thank David and Steven of Beacon Hill Design - www.beaconhilldesign.ca for all your business over the years. 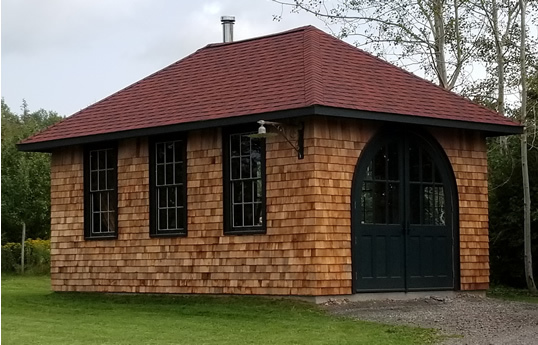 We built this for Avondale Sky Winery - www.avondalesky.com . Great job with the glass Raven! 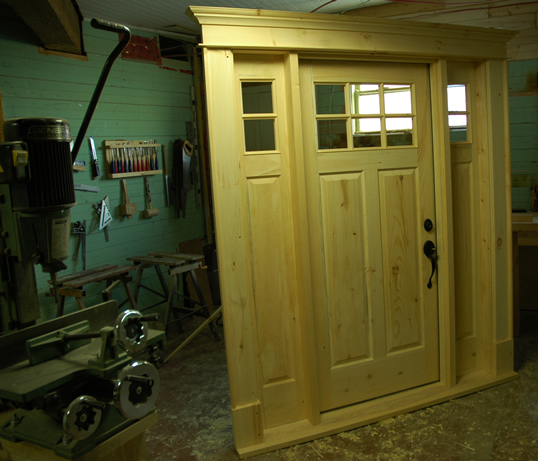 A tasteful, shaker style entry door with a generous trim package going to Halifax. 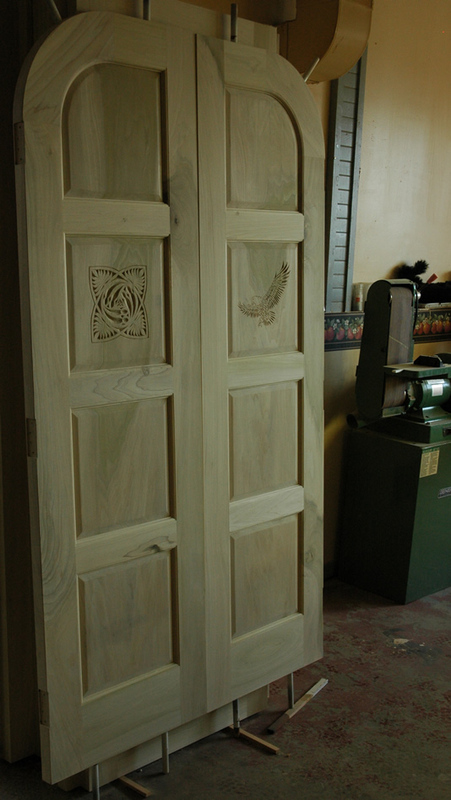 Wood is clear, kiln dried pine. 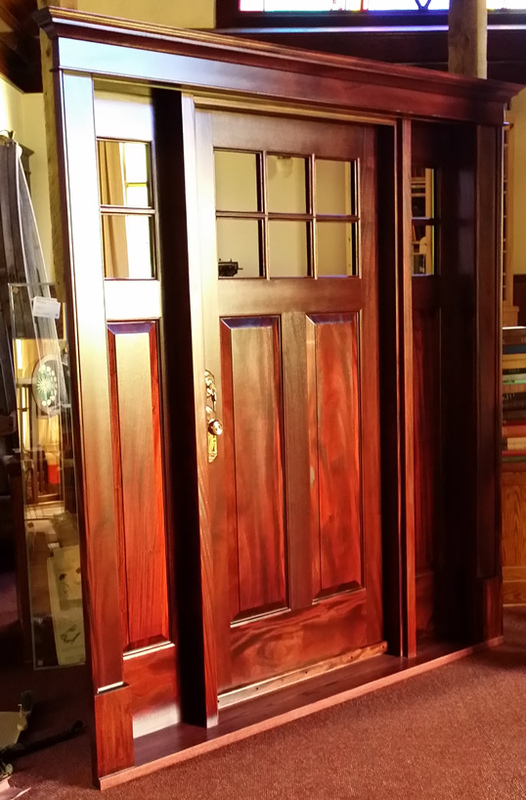 Okay, so we are getting lazy using the camera phone instead of the good camera... in any case, we built this lovely 8 foot high, arch top mahogany(African) entrance for Steve and Christine. Sorry we were a little late on delivery guys and thanks for your understanding and patience. Your home is stunning! 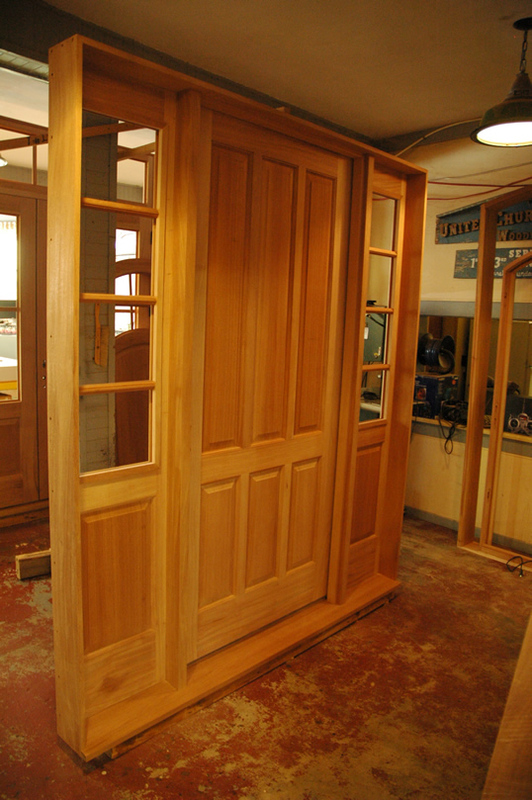 Before and after finishing - two entrance doors we built this fall in beautiful redwood. The 'speakeasy' and ironwork of the dungeon entrance is very cool. Hope the speakeasy is the right height for you Anna! 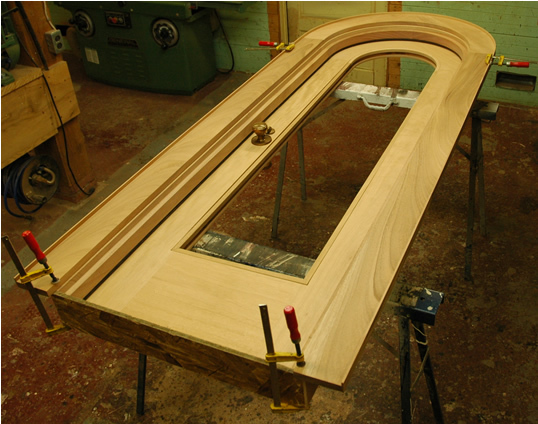 A teak stained, craftsman entrance going to Cornerbrook Newfoundland. 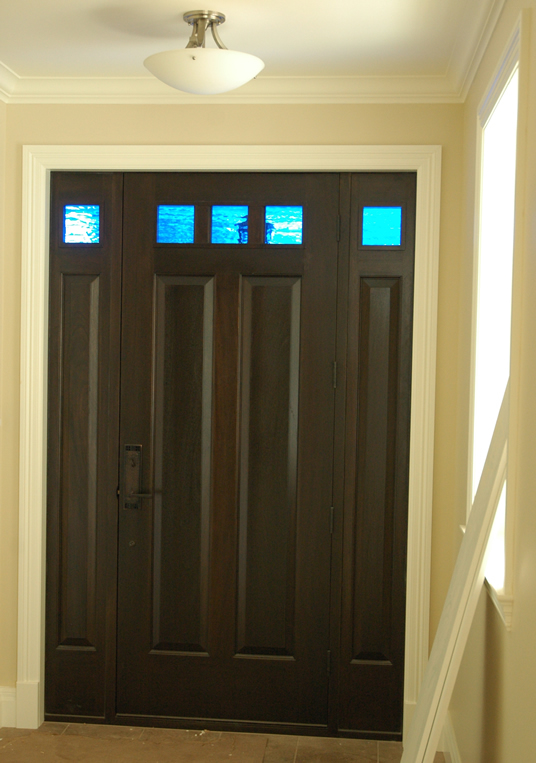 A matching entrance and mudroom door with art glass. These are going to Halifax. 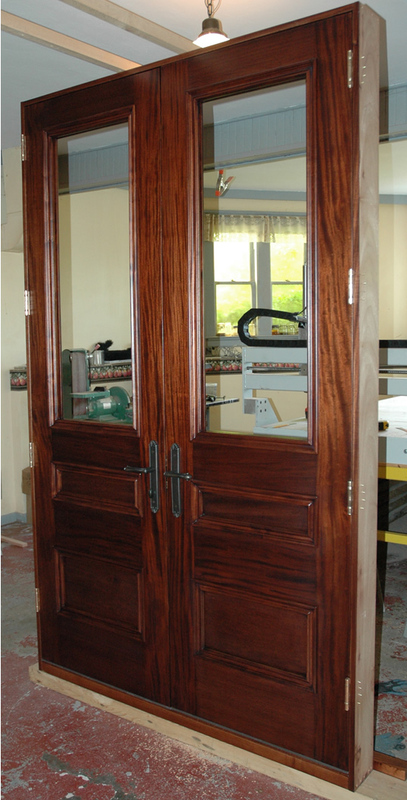 The inside and outside views of a mahogany double door entrance with an art glass transom. 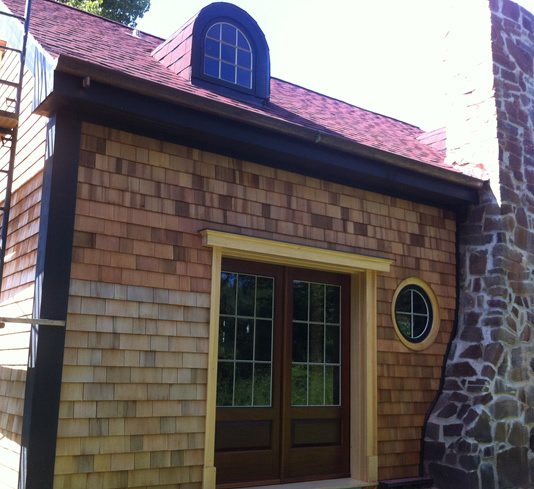 We built this example for Pinehurst Homes in Halifax. This particular client had a love of the California Quail so our in house glass artist designed and created the piece you see here. A very nice final product. 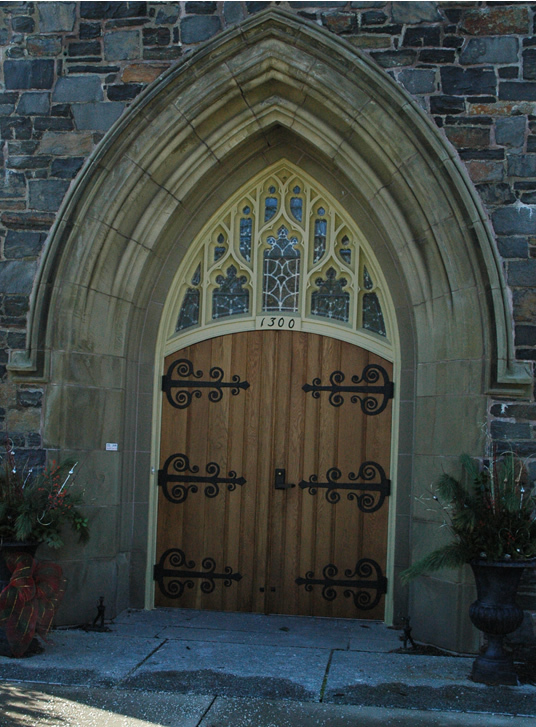 The above are 5 exact replica entrances we built for the First Baptist Church on Oxford street in Halifax, Nova Scotia. 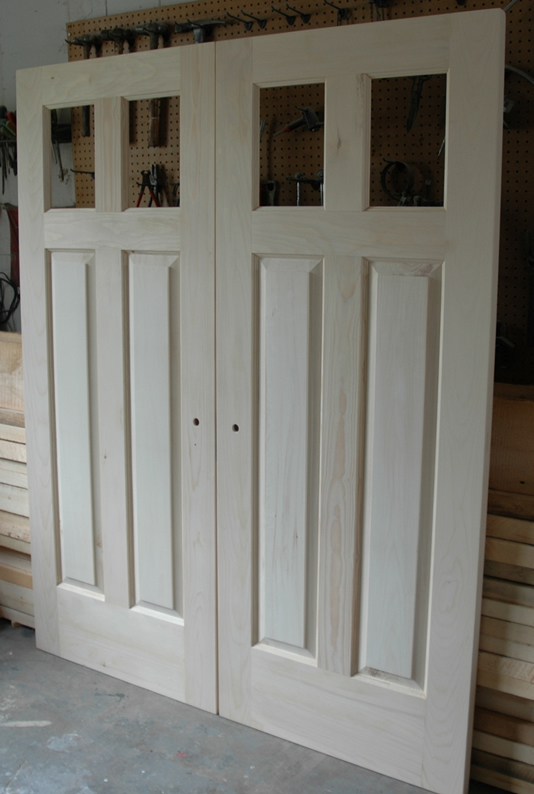 They were all constructed with 2-1/4" thick white oak. This contract was completed on time and budget. 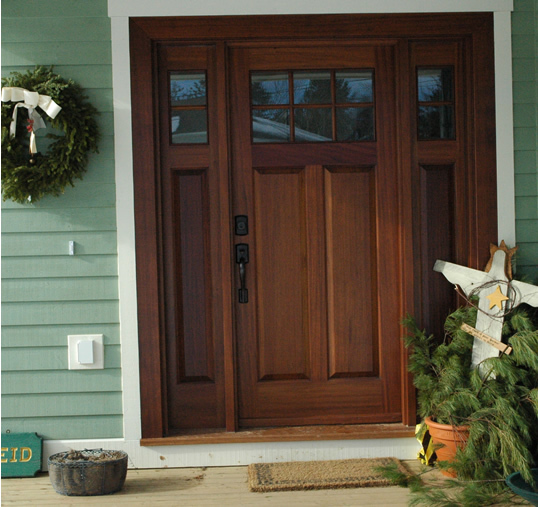 A pine entrance. 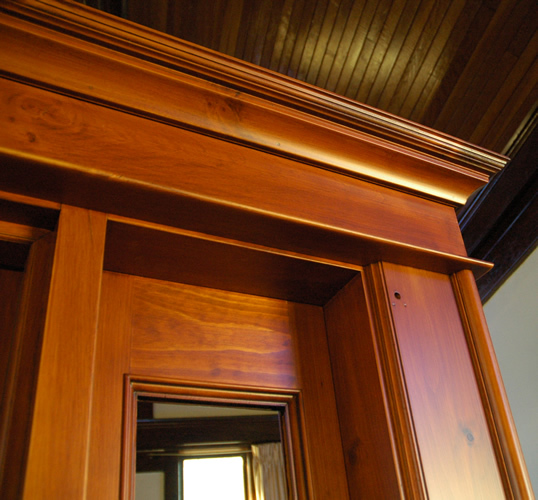 The above 3 images are testament to how we can make pine look incredible. A very classy and aged example. 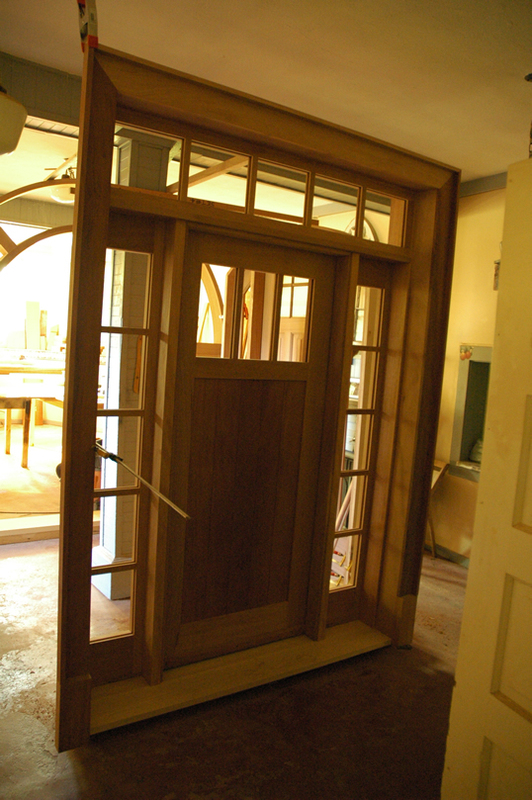 Another eastern white pine entrance - this one with it's heavily mullioned design and radius work will really look fantastic once stained and installed. 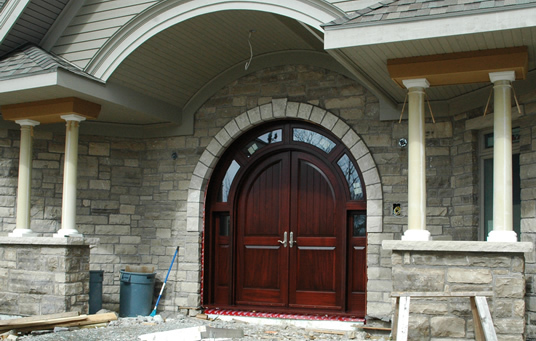 An mahogany arch top entrance ordered from one of our best high-end builders in Halifax. Keep the good designs coming Todd! 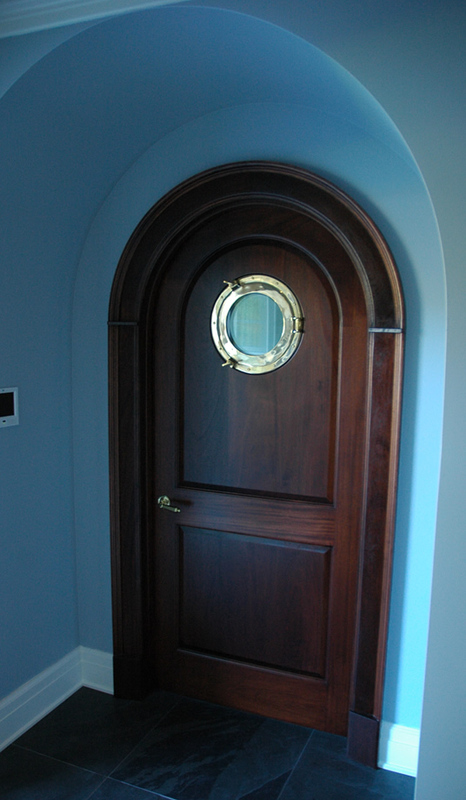 Another mahogany entrance. 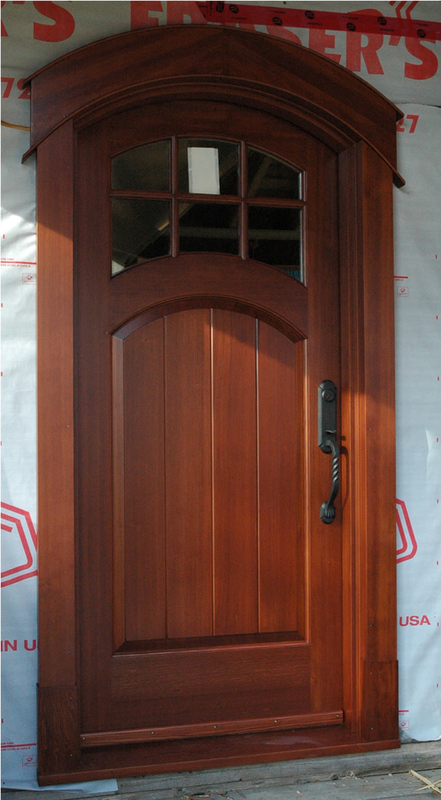 This one with really nice tongue and groove batten door. 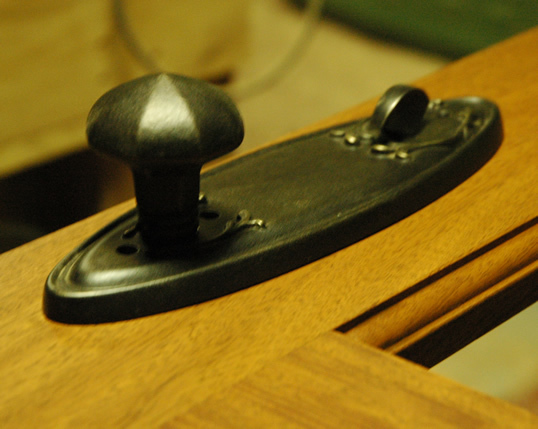 Stain choice for this local customer was traditional dark mahogany. This owner really understood this importance of going all the way not just with the entrance system itself but the entirety of the surrounding entrance. It should take the home owner a great deal of time and planning to get this just right. 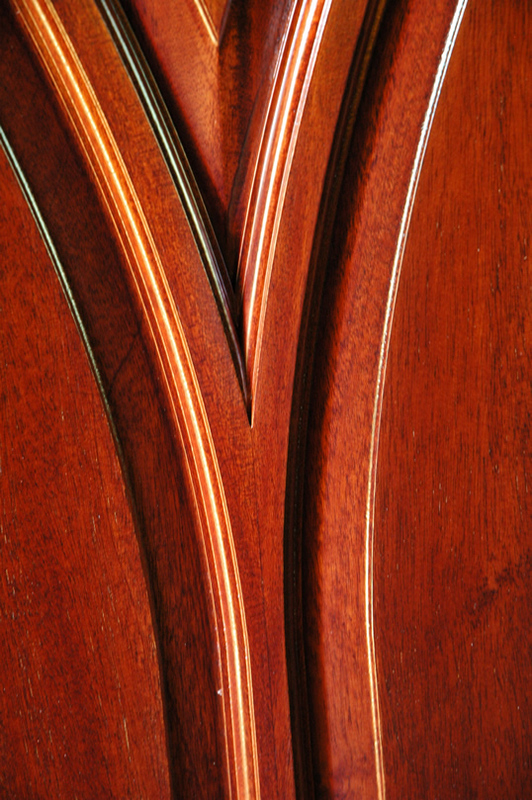 The above 2 images of a mahogany entrance. 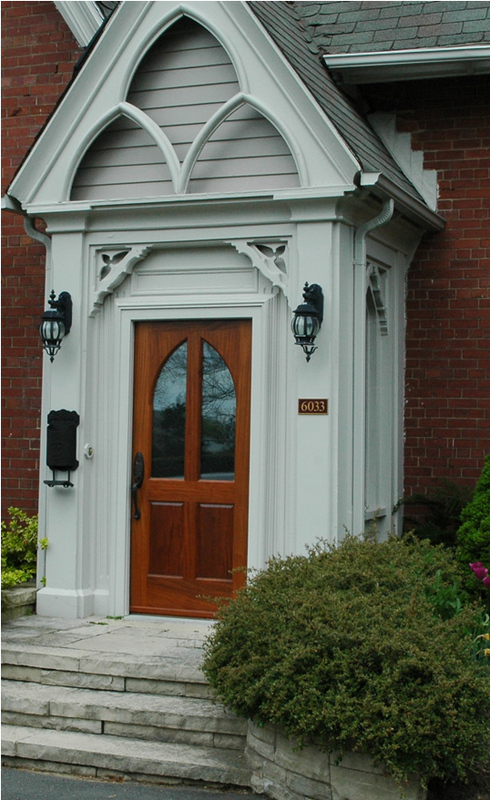 This entrance is a good example of what you achieve with trim even if you don't have the room for a large entrance. 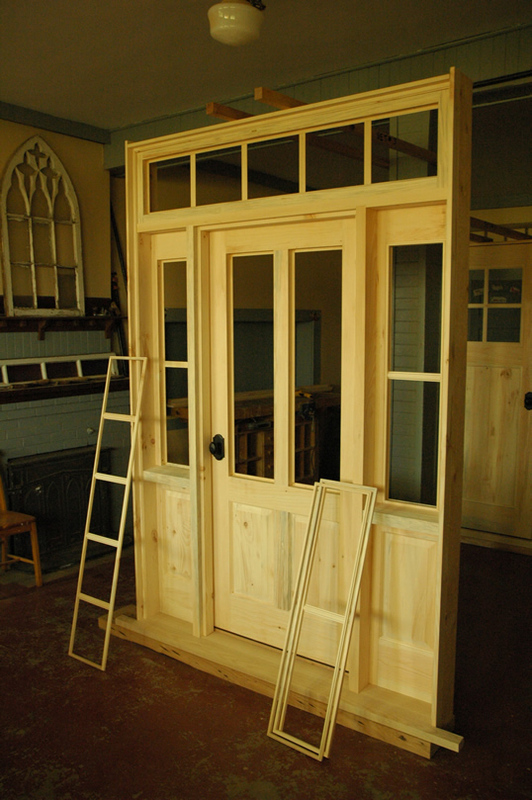 A pine, double gothic door for a local church. 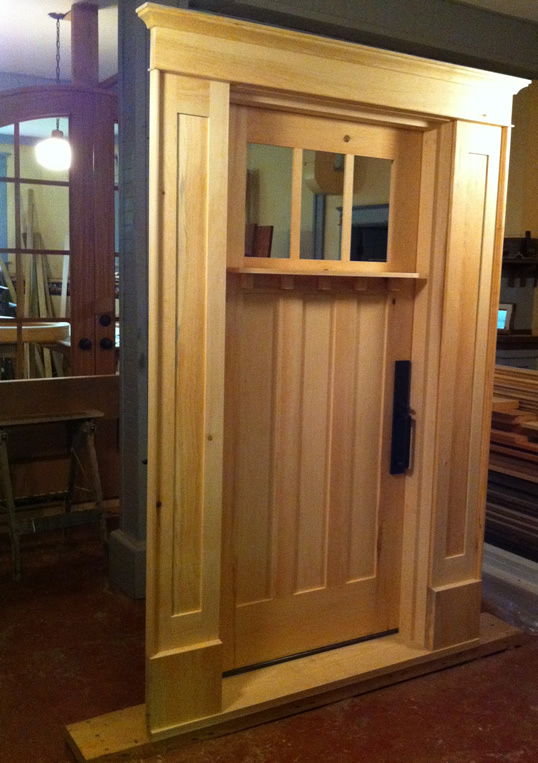 We really can create anything you want at the Wooden Window And Door Co.
Another pine entrance. 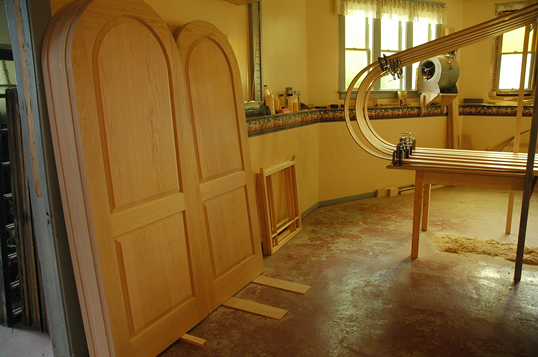 This one has a huge door at 42" x 96". 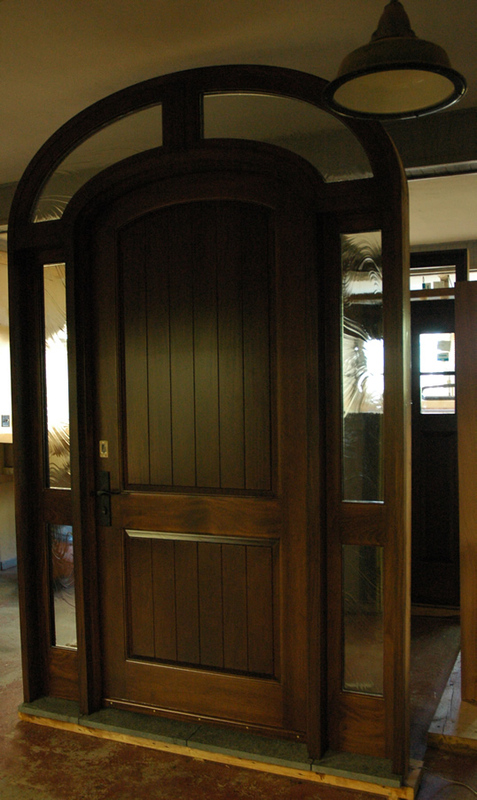 Upon the owners request we age-finished the entrance to give it a real historic look and feel. 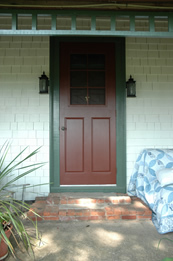 A paint grade entrance that is an exact reproduction for a Nova Scotia heritage property. 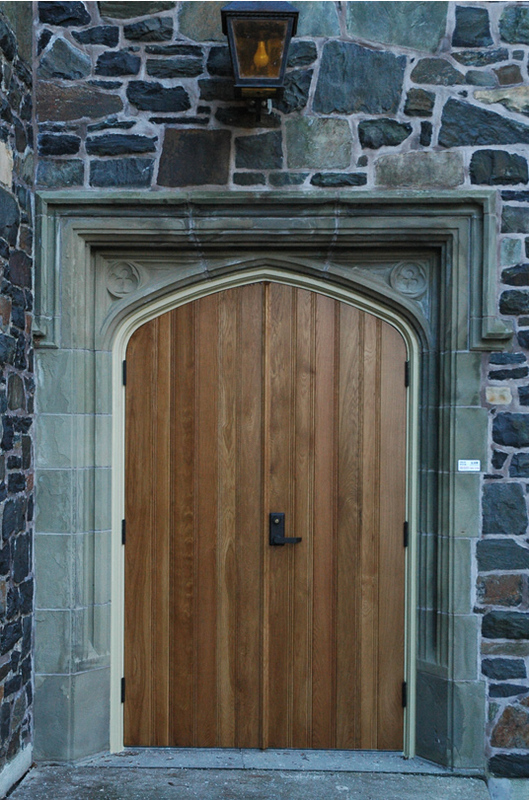 One of our aged series entrances. 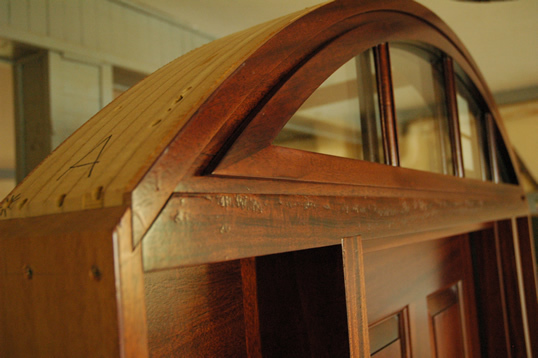 We included a dentil shelf with dental work on the underside. 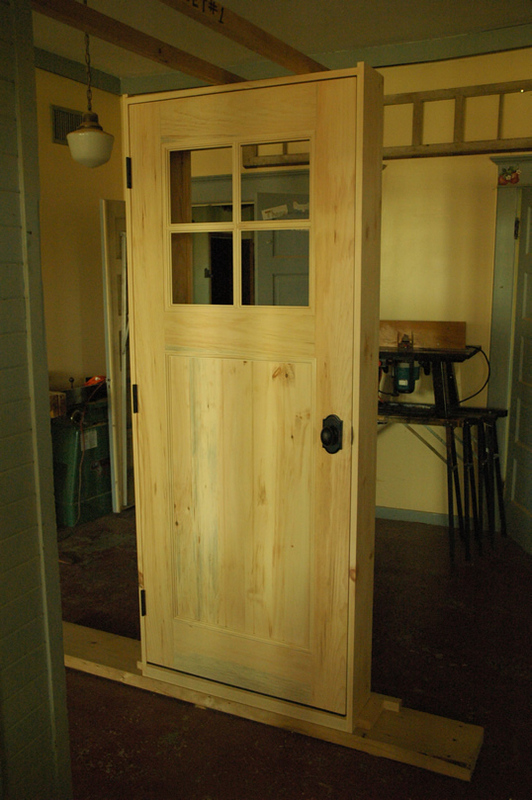 A modest 4-lite pine door for a home on the south shore. 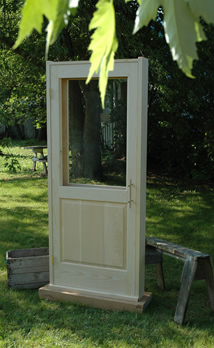 A paint-grade pine door with a combination screen/storm door. Very traditional and will look great in royal blue. 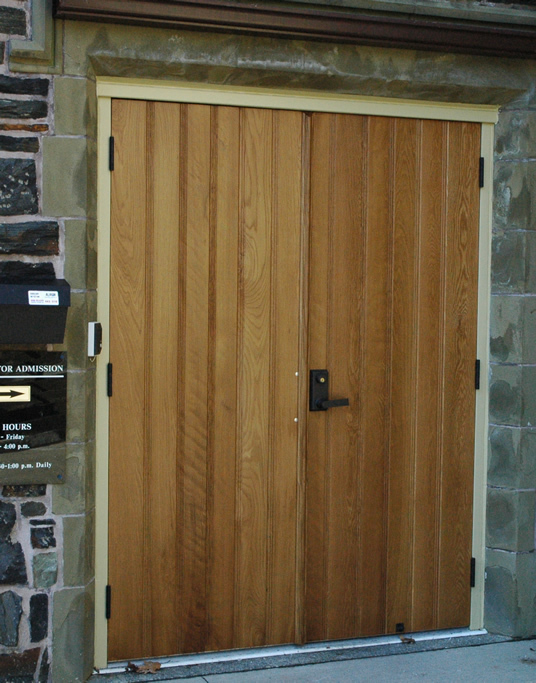 A solid ash entrance we built for a spec-home in Halifax - heavy. 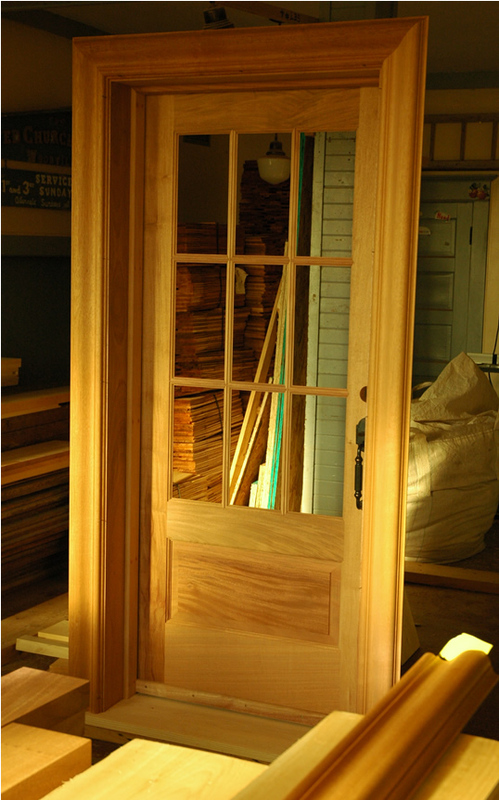 A chamfer door made of tulip poplar for the raised panels and american yellow poplar for the rails and stiles. 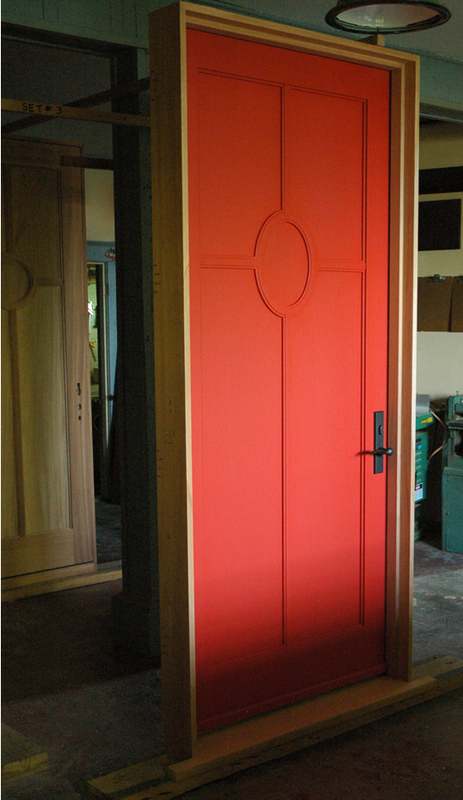 This was supposed to be a paint grade door but the contractor so liked it they decided to go with a stain. Turned out to be a smart decision. 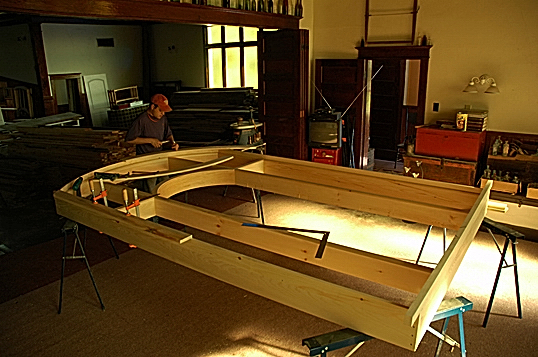 Above you see the making and final install of a super-entrance we call the "Three Sisters". This entrance is just shy of 12 feet and beautifully designed and constructed. 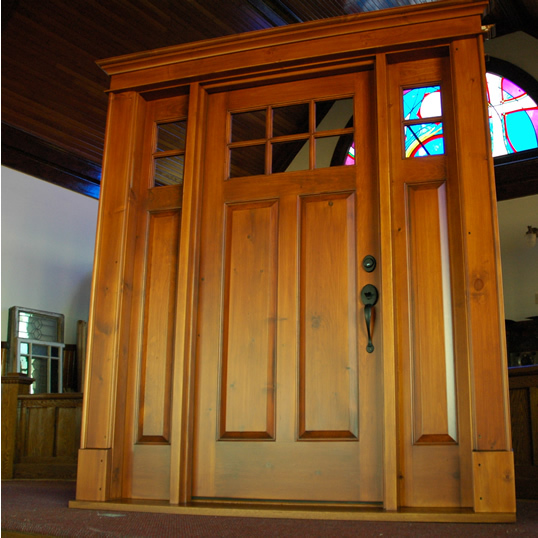 This is the ultimate in grand entrances and we are pleased to offer 2 others (one in white pine, one in red oak) for sale. 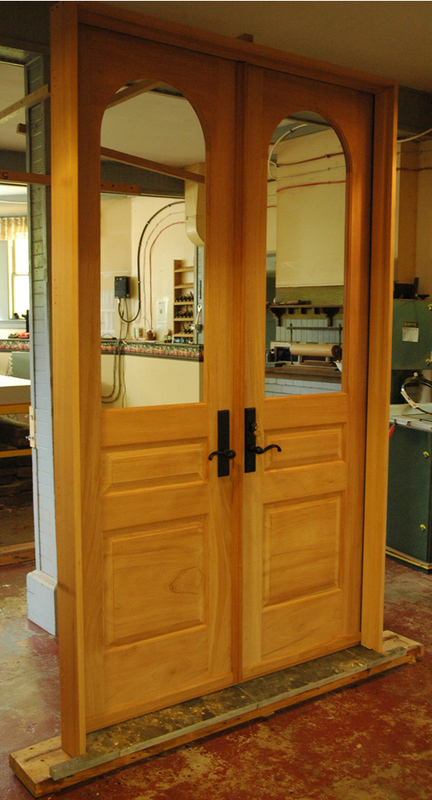 A sliding cherry door we built to integrate into an all cherry wood kitchen. Cranberry Stained Glass crafted the art glass. 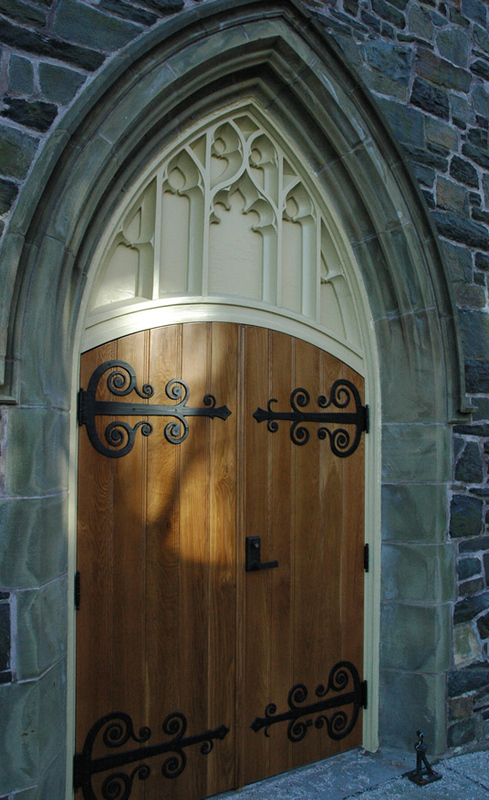 A entrance door we built for a church in Windsor, NS. This is a replica of the original. 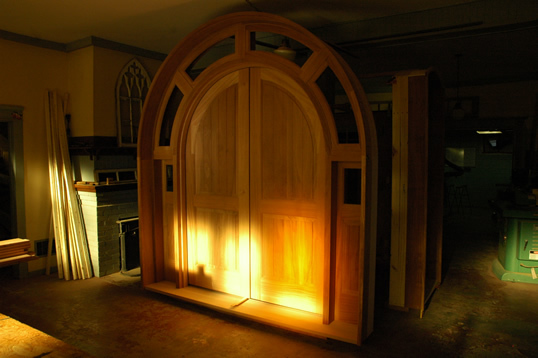 Interior red oak arch-top doors and jambs under construction for a home in Halifax. 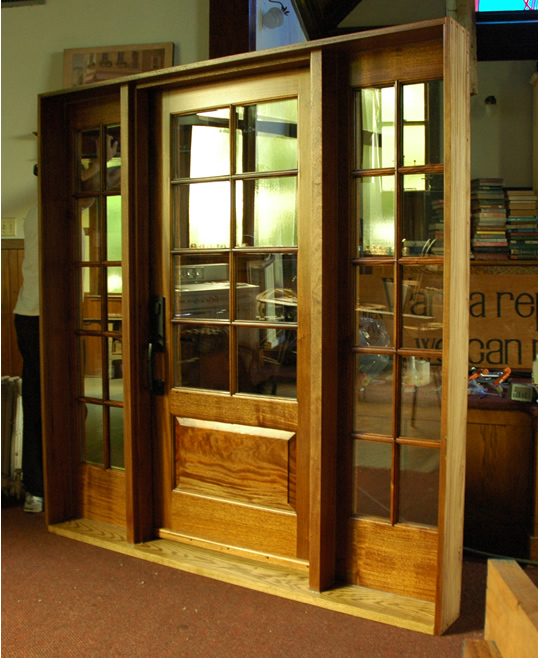 These doors weigh over 100 pounds each and are a thick 1-3/4". Below you can see the finished product installed. 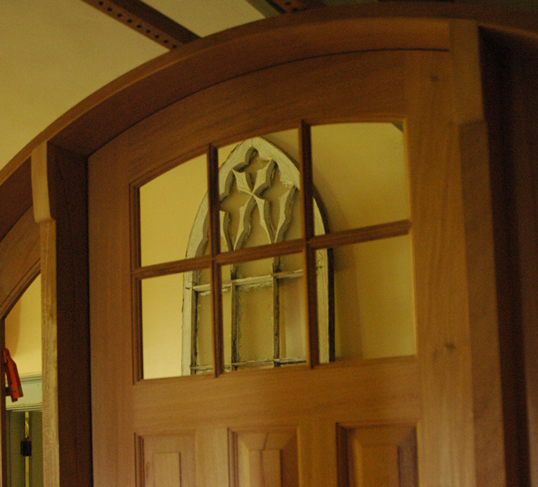 Eight foot high, true arch double doors that will enter to a private library. 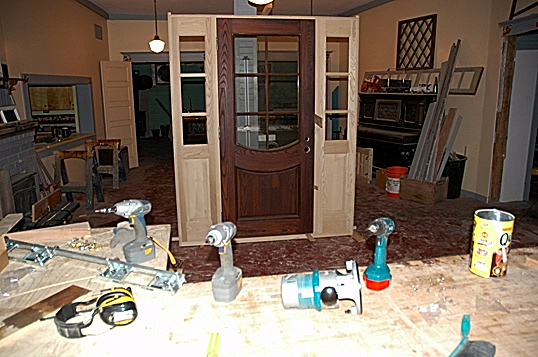 Below is a picture of the door finished and installed. 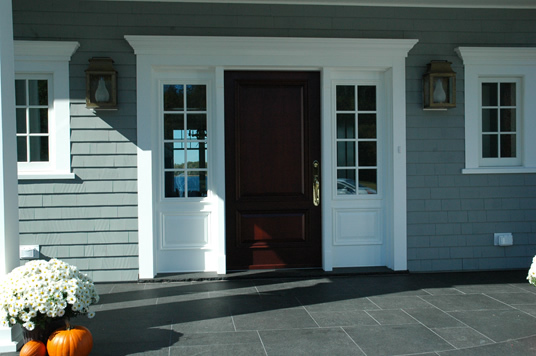 One of our more stately, colonial entrance systems. 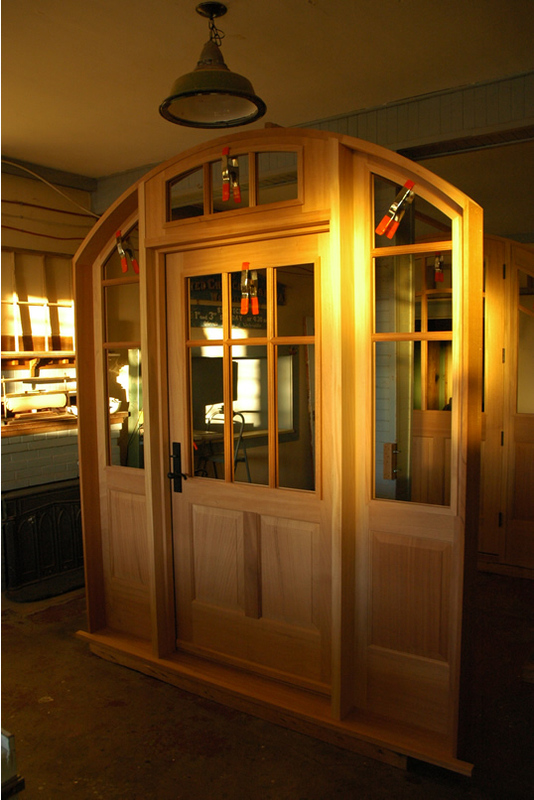 This one we built of solid mahogany with a 2" thick solid ash threshold. 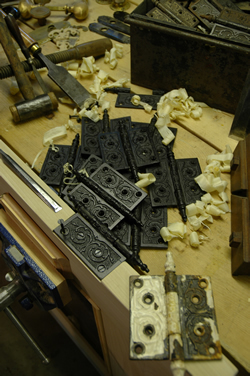 Shown below is a picture of the dental work which is also mahogany. 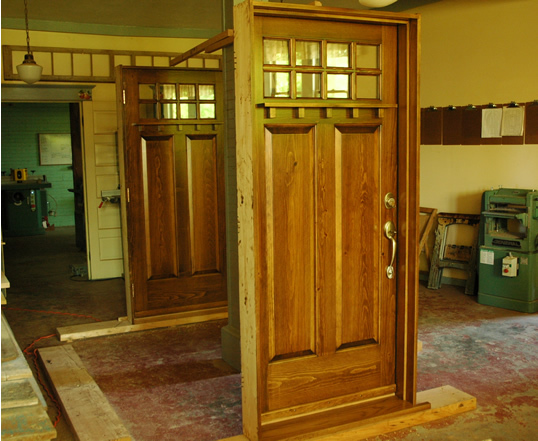 Here we have just completed 10 replica oak doors for the Stadicona naval building in Halifax. These are 2-1/4" thick red oak - very heavy. 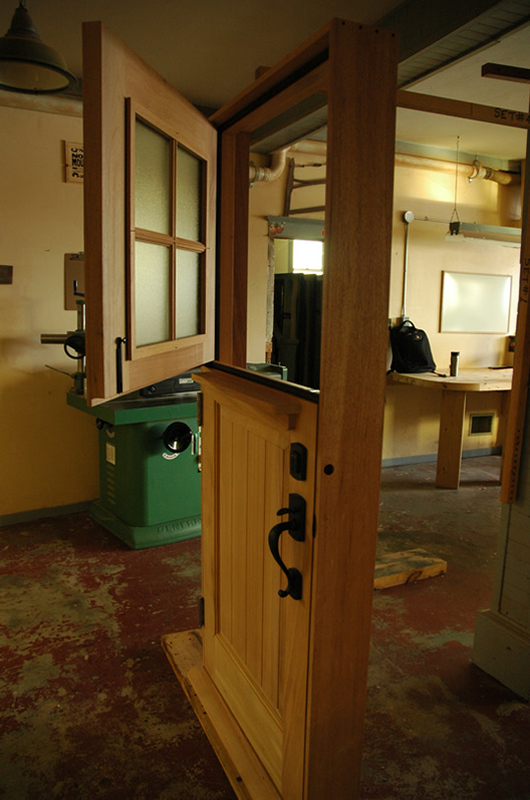 A mahogany entrance we designed, built and installed for a private school. We were requested to come up with a design for this school's new theatre... after spending some time in the building this is what we came up with. 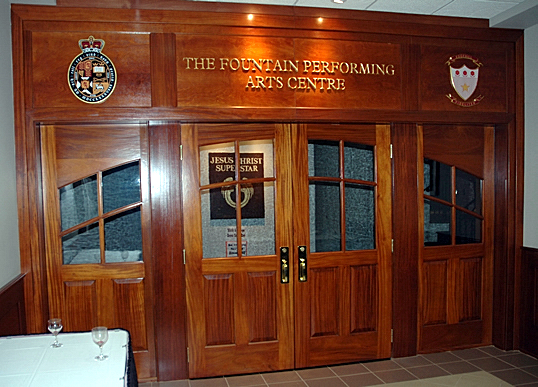 We think it captures the feel of the old world theatre quite well. 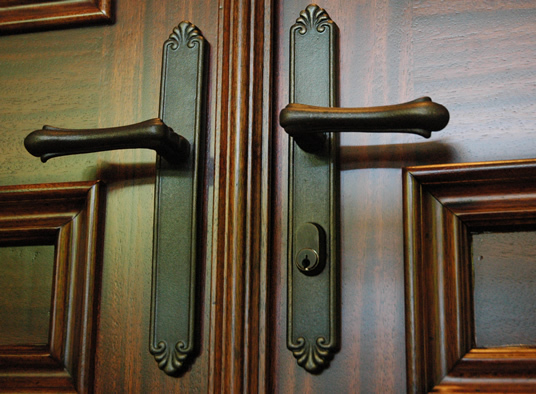 We have a superior finishing system that is second to none. 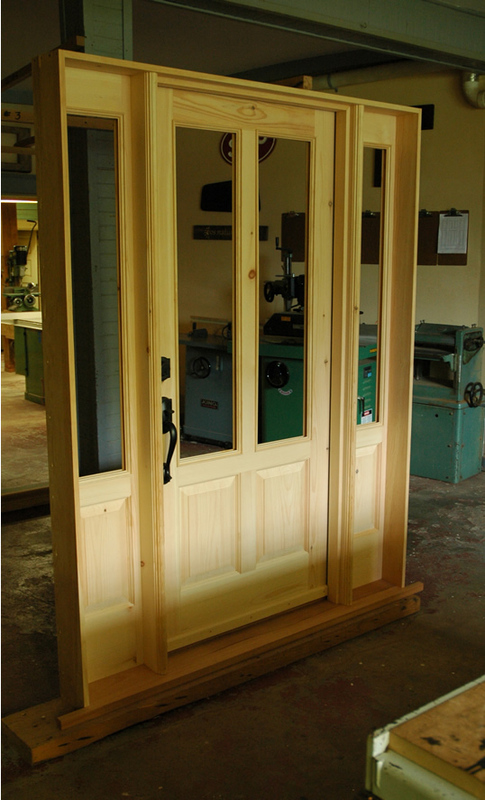 We built these doors for a very discerning client. Below you can see these installed. 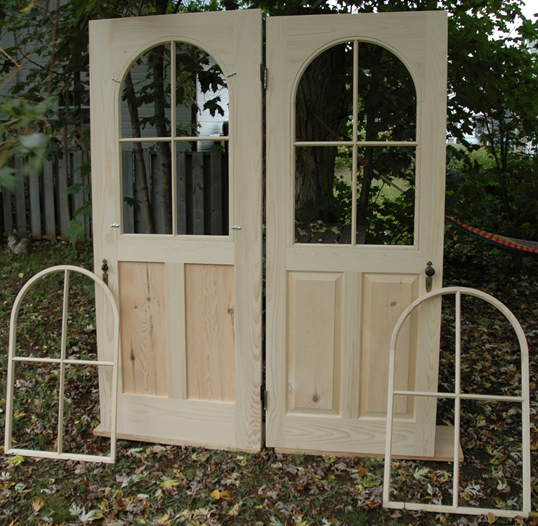 We had a blast designing and building this double door set. 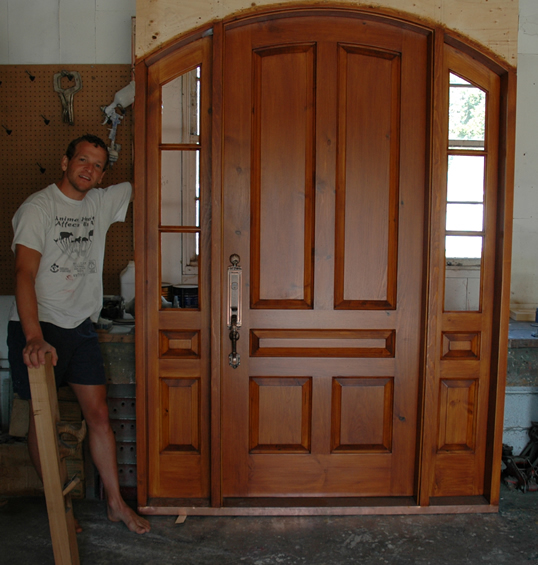 These are 8 foot high doors. Can you see the railing reflection? 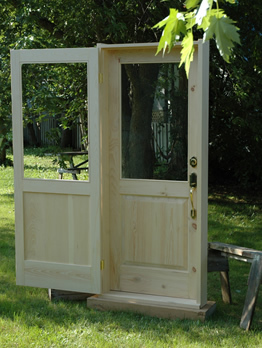 This would be one of the more challenging doors we have built. There is nothing you can imagine that we can not create. 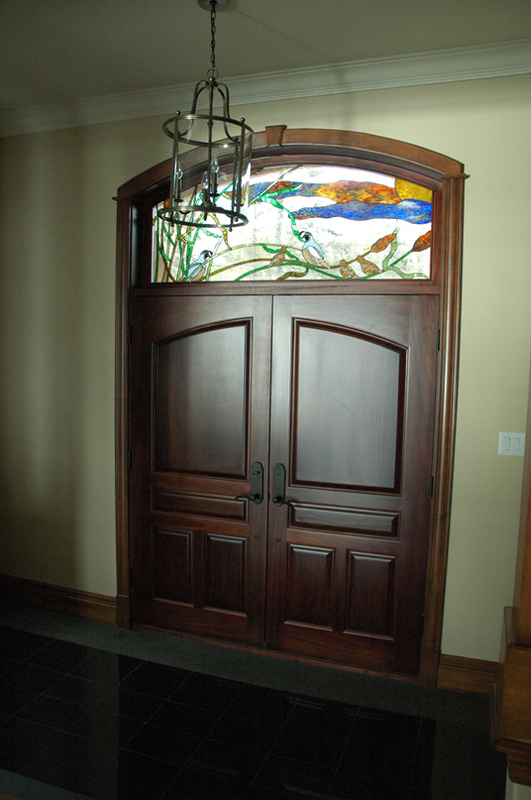 A solid mahogany interior stained glass door we built and installed. 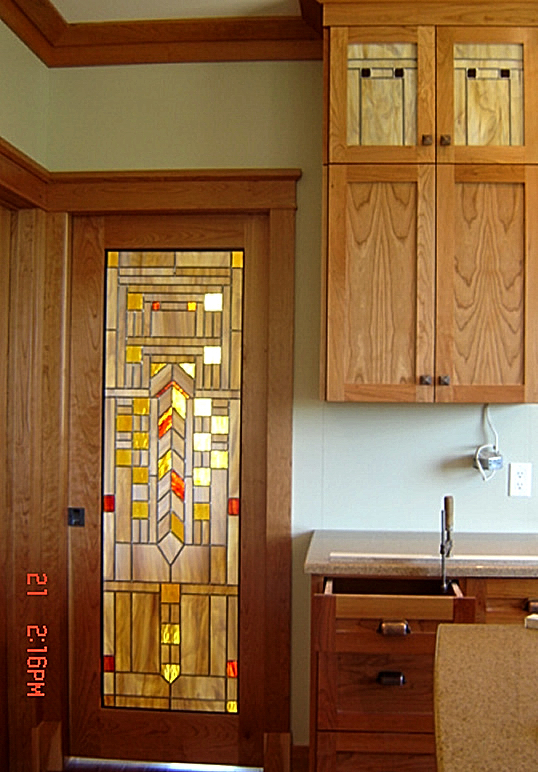 If you have a nice piece of stained glass that you would like to see in a door or window we can easily and tastefully do this for you. 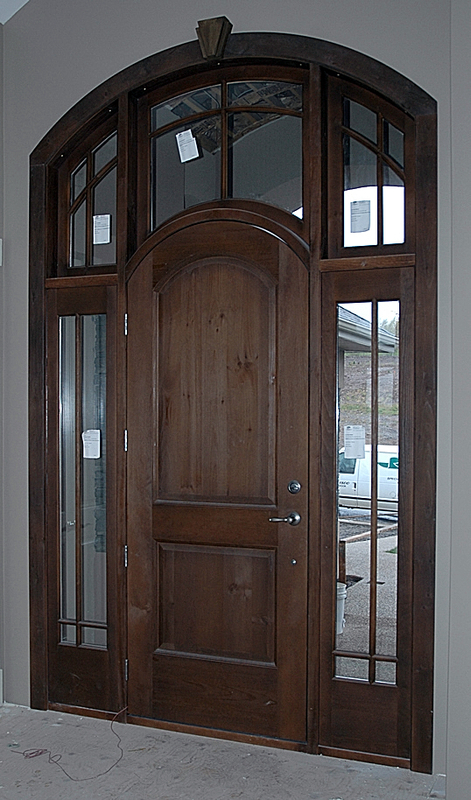 A very rustic entrance we built for a couple building a new home in Grand Pre. 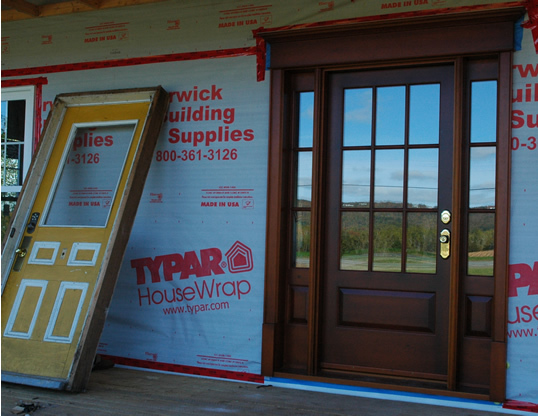 The walls on this home are about 9 inches thick so we built this entrance with equally wide jambs. 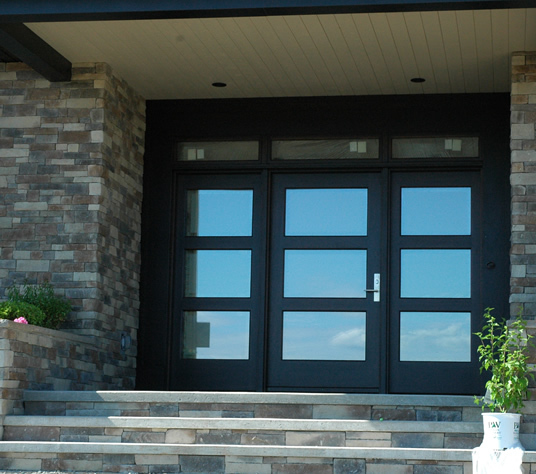 Our custom entrances integrate perfectly with any building project. 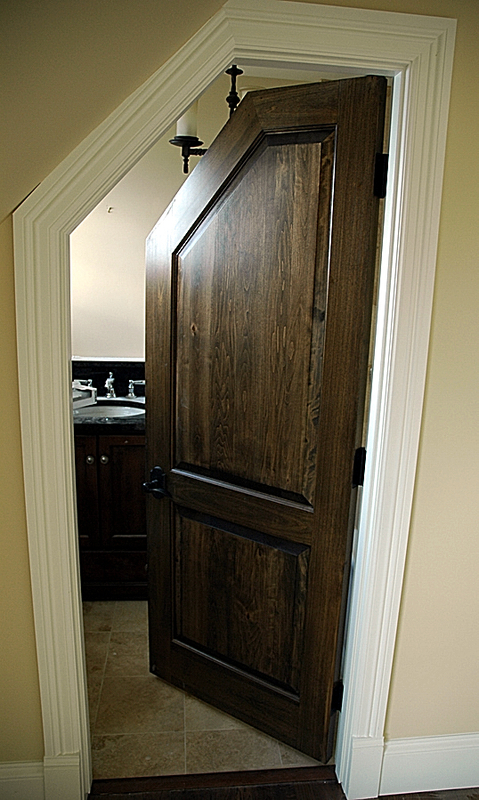 Many door companies only have standard size jambs that serve only to make an entrance look like an after-thought. 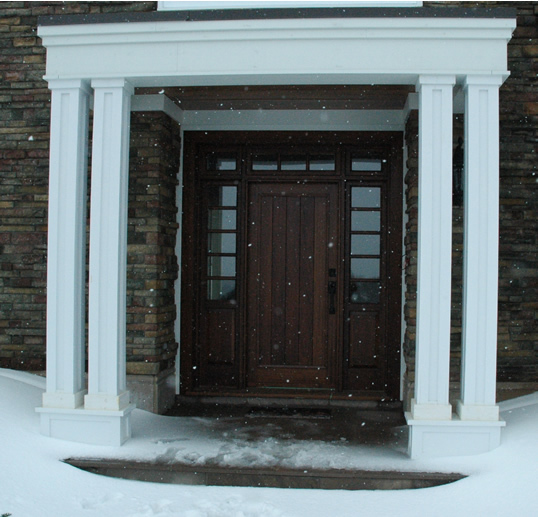 Just one example of a custom entrance system we built. 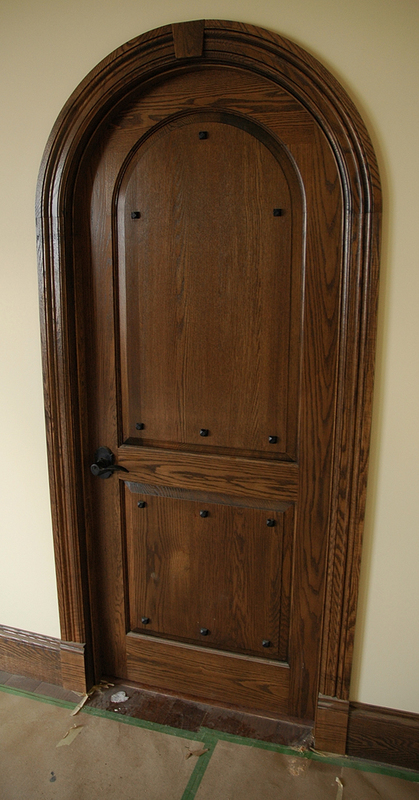 The door in this particular example is over 3 feet wide and very tall. 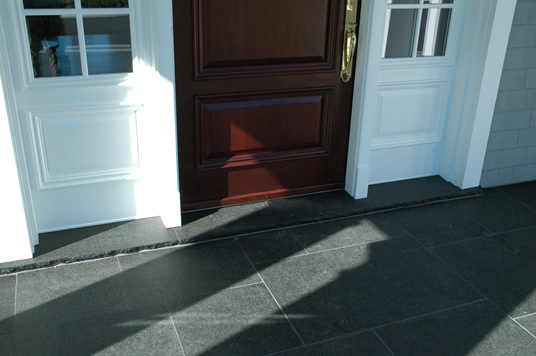 Large entrance systems are nice - they have a certain appearance that everyone will notice and appreciate. 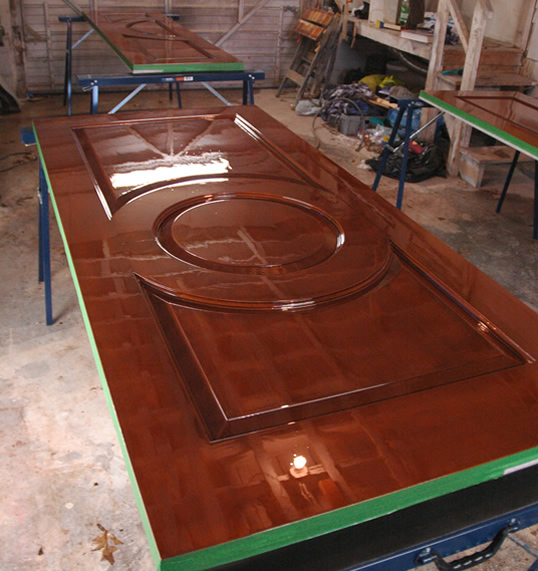 You will notice that we wrapped the base of this entrance system in copper which will 'green' over time giving a really wonderful contrast with the teak stain. (CLICK HERE for close-up images). 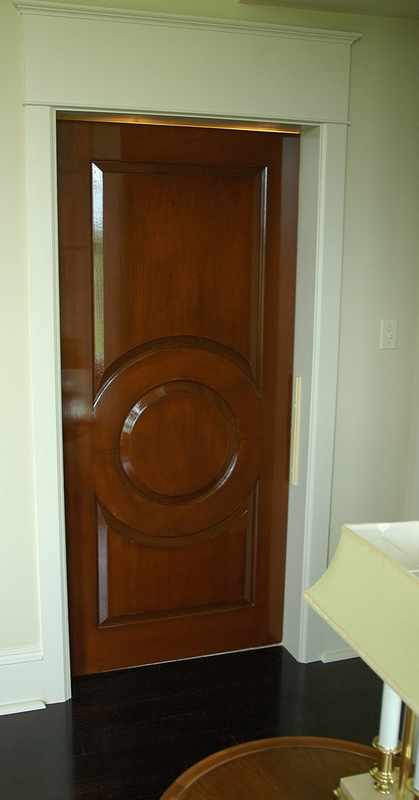 A large solid mahogany entrance system we built. 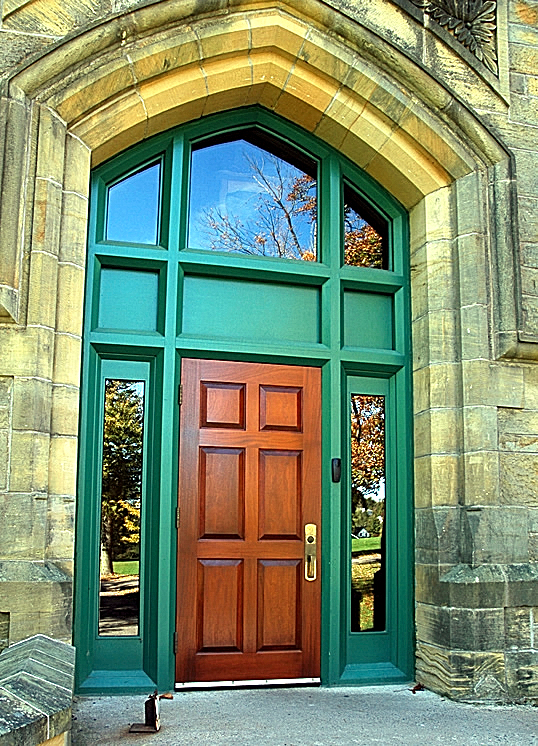 We installed custom leaded glass and like most of our entrance systems this one has it's sill wrapped in copper. 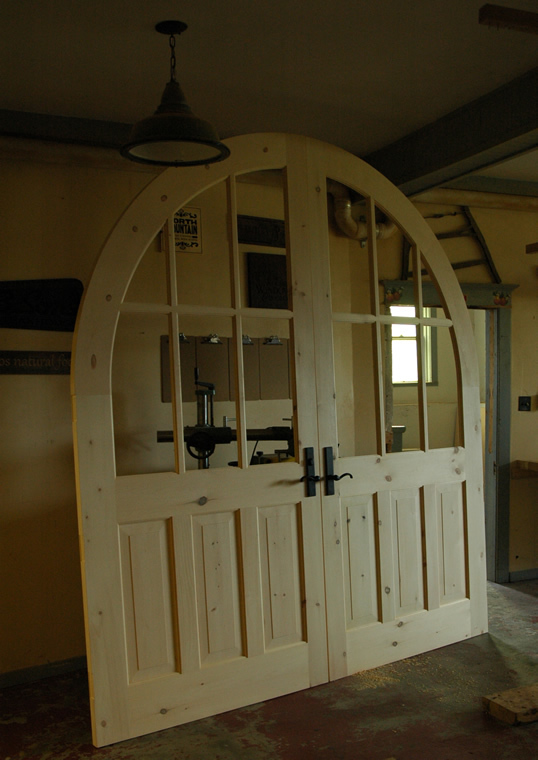 We also make custom carriage style garage doors. 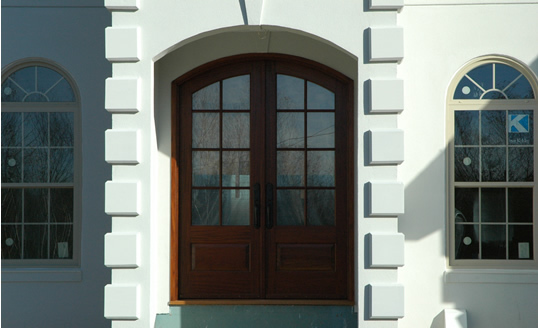 Our carriage doors are the highest quality overhead garage doors one can buy. 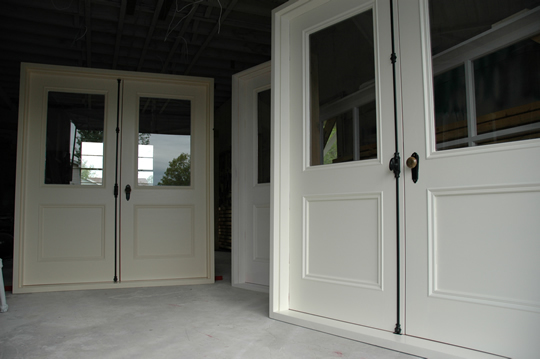 Our customers all have one concern when ordering carriage garage doors: "WILL THEY LOOK LIKE REAL SWING-OPEN CARRIAGE DOORS?" This is inherent in every design we do. Again, striking just the right balance between form and function, a garage door that opens with the press of a button but has the appearance of a real carriage door. 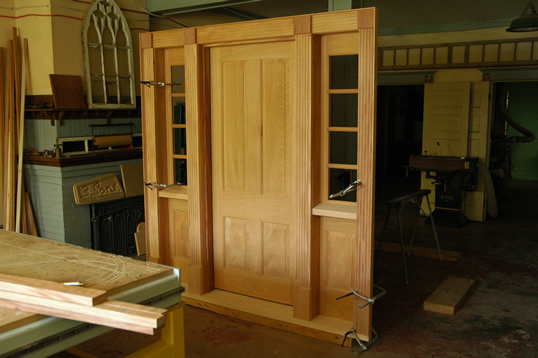 The above image is 2 sets of carriage doors made with western red cedar. 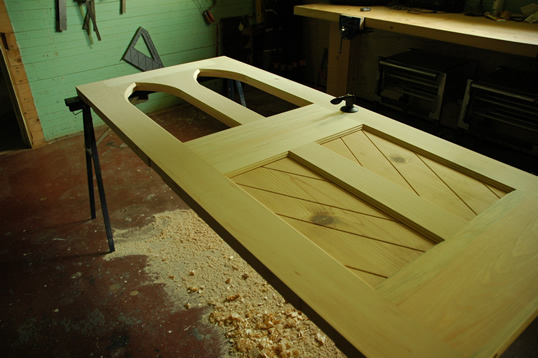 All our garage doors are constructed with full, through mortise and tennon joinery. They are built to last and perfect in every way. 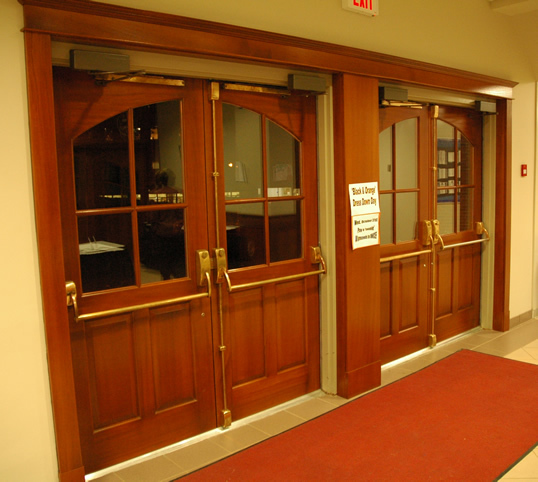 Below you can see them installed with an accompanying pedestrian door. 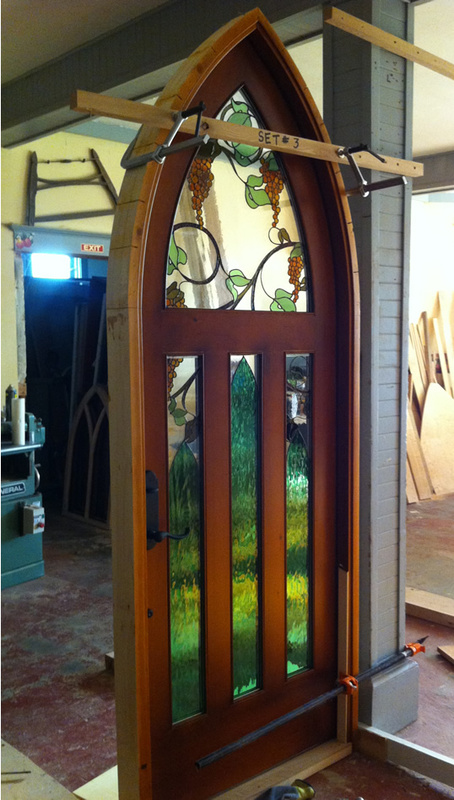 An eight foot high mahogany door with a stained glass piece atop. 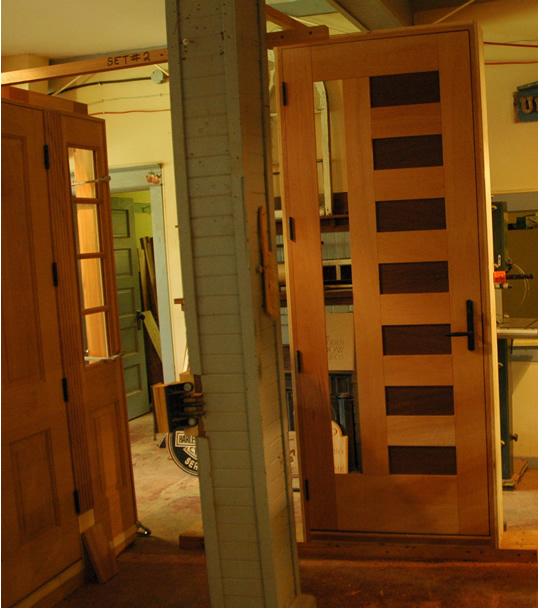 Louvered door sets we built. 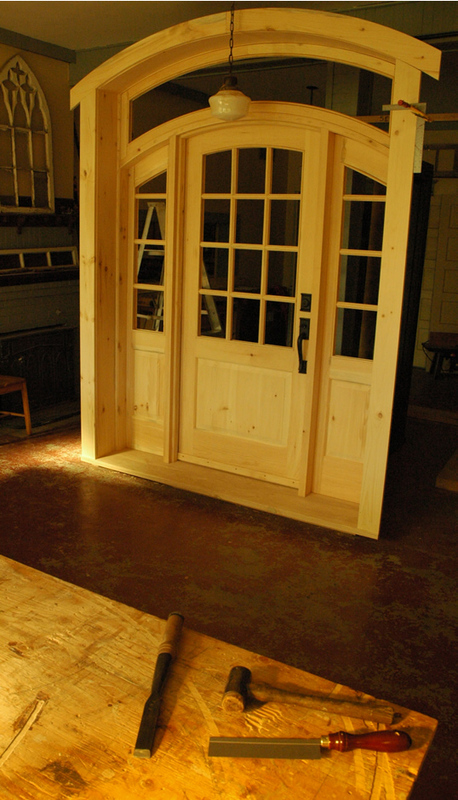 These are double door sets that are going into a guesthouse/carriage house. 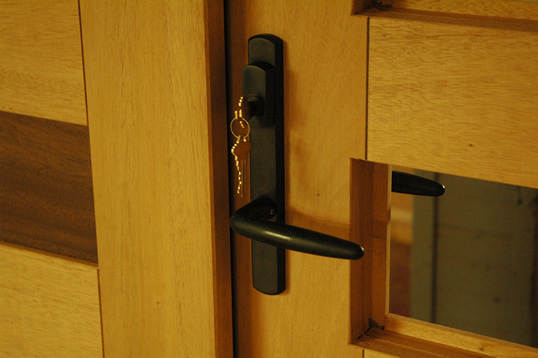 They are real door thickness and heavy - not the thin, cheap looking, flimsy ones that vibrate upon opening and closing. 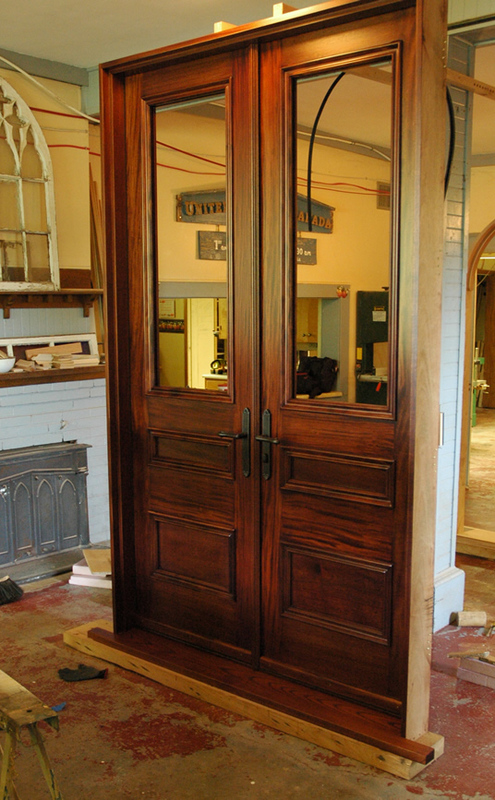 One of twenty doors we built for a 1920's bank/insurance building. This popular landmark building added on a large addition to the existing building. 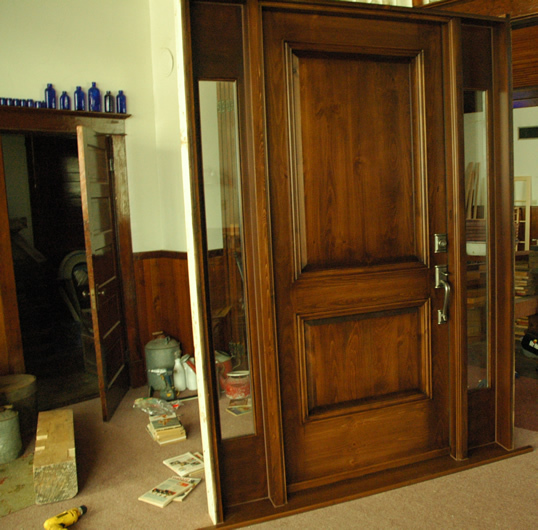 The owners, wanting to keep the same 'look and feel' of the building commissioned us to build them replicas of the existing doors. 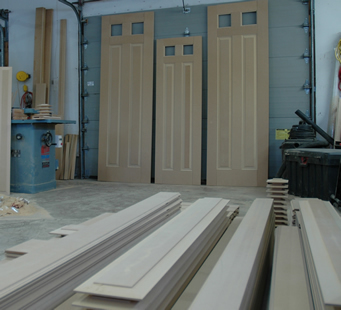 Our company now has the facility to accommodate larger production orders. Orders are completed on time and budget. Do you like gothic? 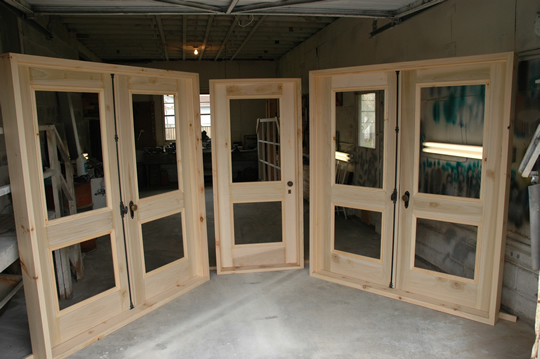 Pictured here are the back and front views of a 36 and 32 inch set of doors ready to ship. 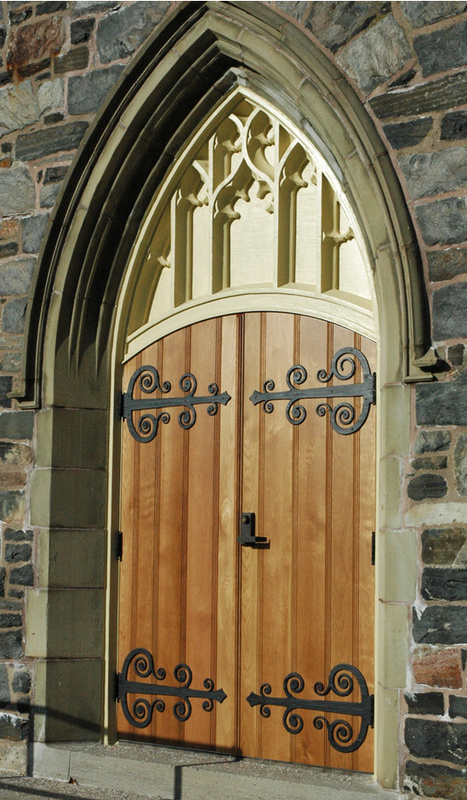 We have received so many requests for this 2-panel, gothic screen/storm combination door that we now keep them as a regular stock item. 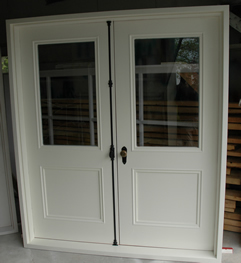 We believe this to be the most attractive screen/storm combination door ever designed - the proportions and style are perfect in every way. 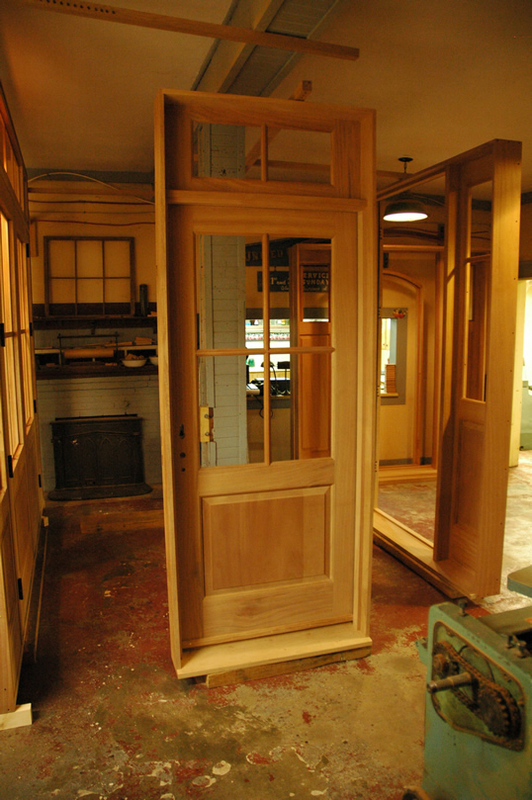 Each door ships with one screen and one sash insert. 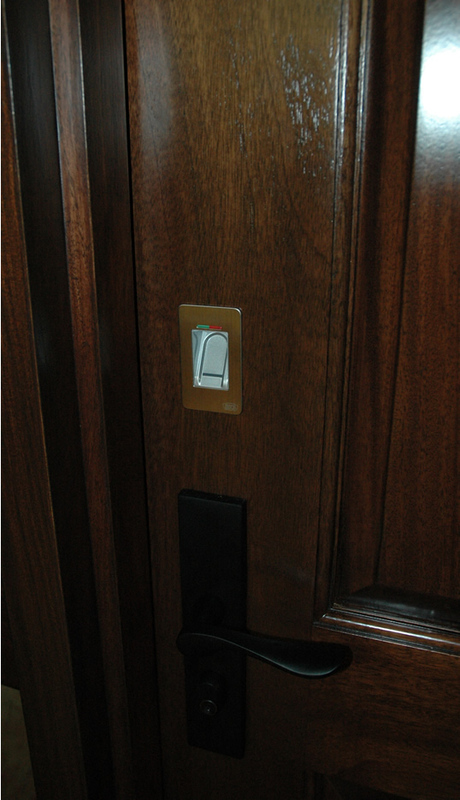 'Turn Buttons' hold the sash or screen in place depending on the season and old fashioned hardware is included ( CLICK HERE for close-up images). NO FINGER JOINTED WOOD USED HERE! 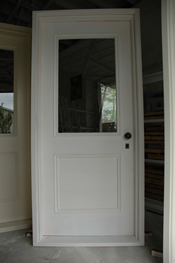 Double screen/storm combination doors. 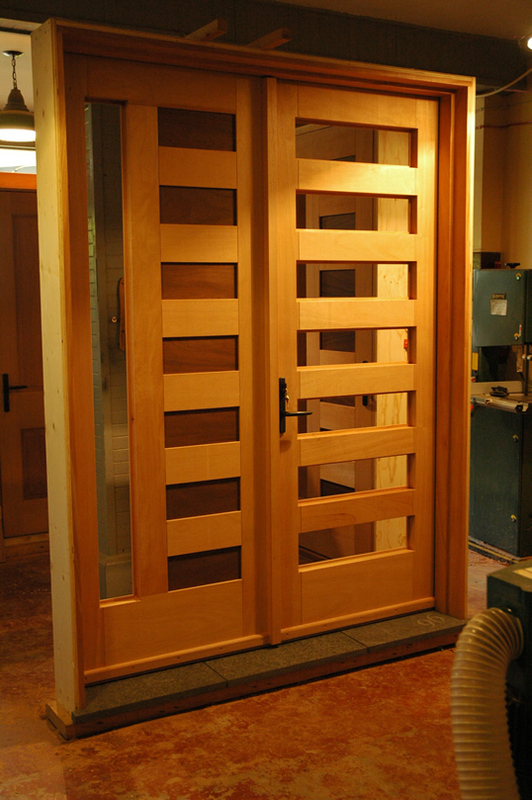 We also built identical 2" thick exterior doors for this entrance way. 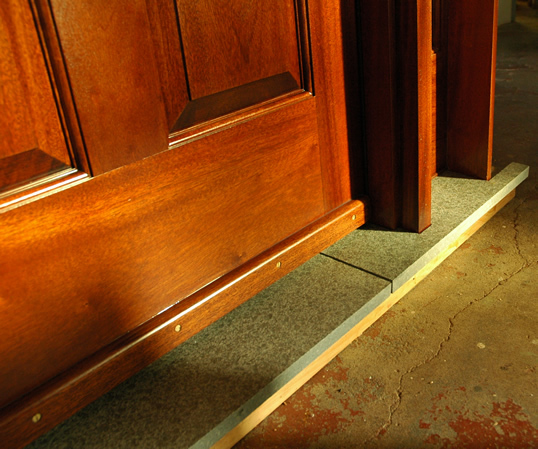 Cremone bolts hold both stationary doors in place. The ultimate garden/pool gate. This one is 4 feet wide and just shy of 8 feet high. 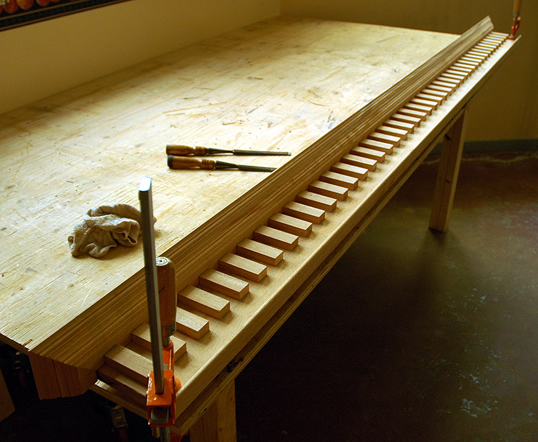 This v-groove batten style gate gets lateral strength through a series of thick hardwood splines running transversally through the middle of each board. 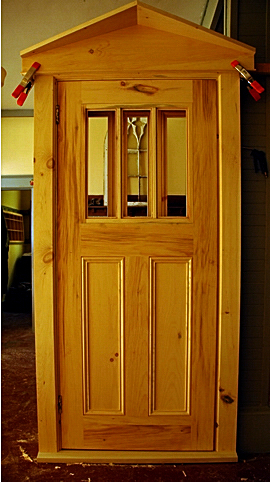 The wood species is clear pine. 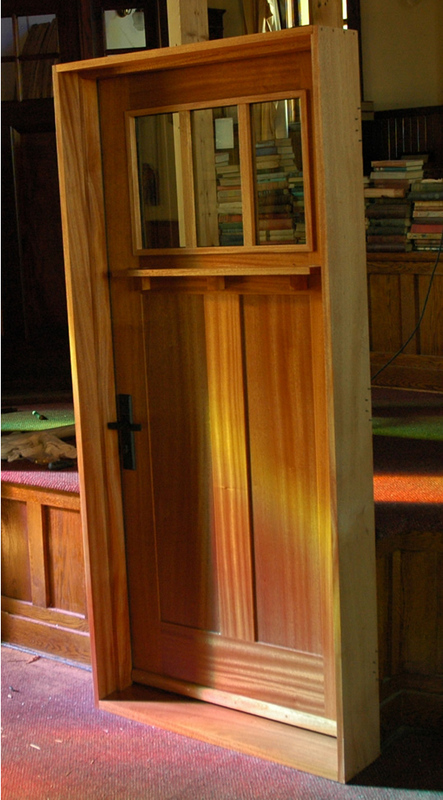 Above we have a series of pictures of a jambed screen/exterior door combination. 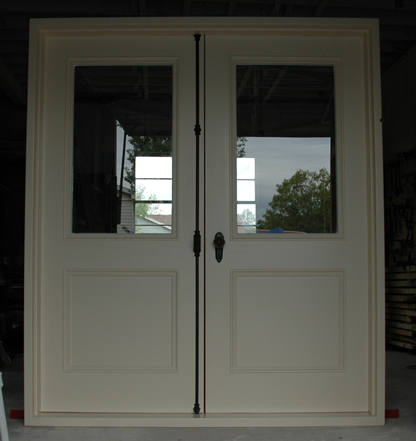 This is a matched set unit in that the screen and exterior door are the exact same style - a single panel door. This is the ultimate in entrance customization. 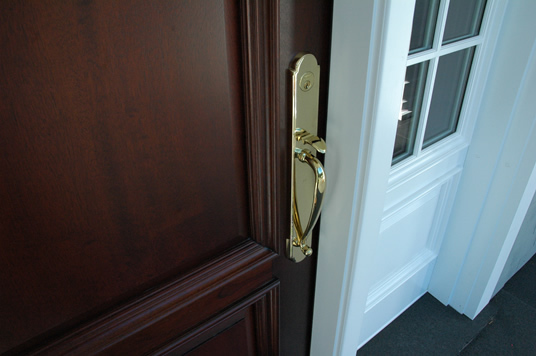 This type of construction simply is not found in the mainstream door industry. 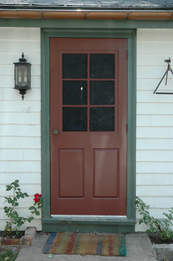 The screen door is standard old fashioned size of 1-1/8 inch thick and the exterior door is 1-3/4 inch thick. 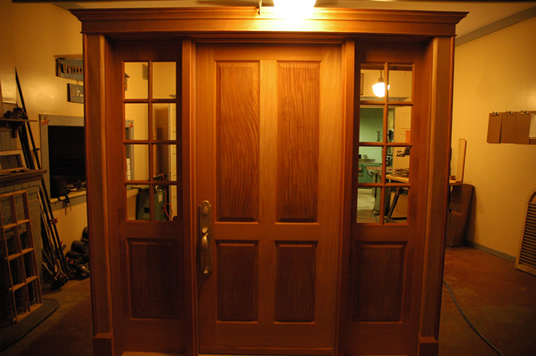 Both employ mortise and tenon joinery. A very tasteful combination. 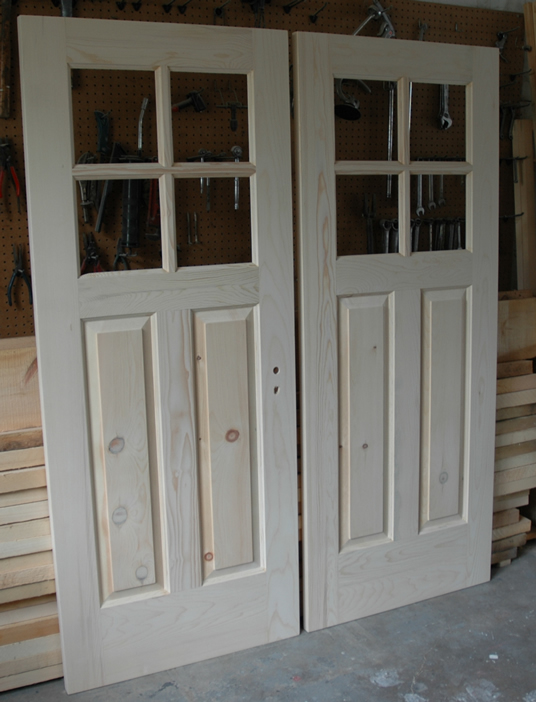 Matching double doors that will go on a small barn. 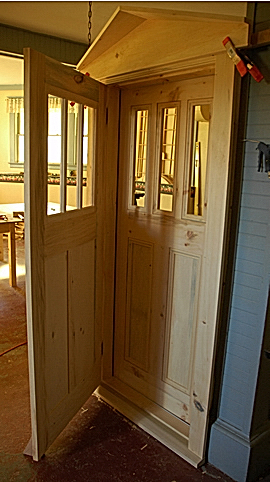 Interior doors for an old farm house. 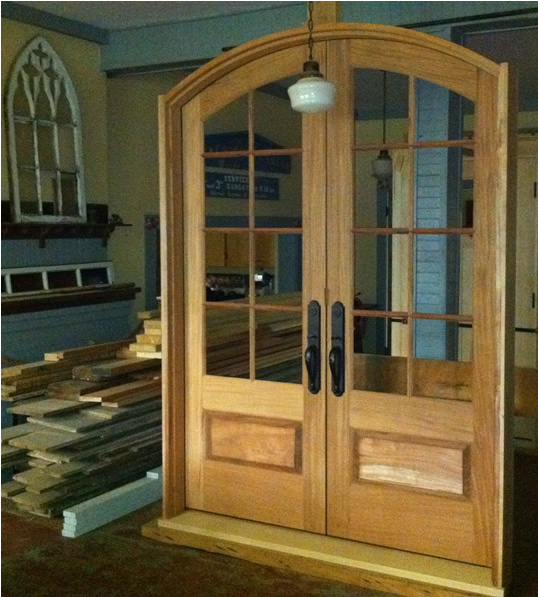 The glass for this set of doors will be yellow opaque glass - 100 plus years old having come from the St. Marys church in Halifax, NS. 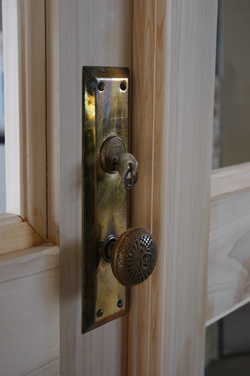 For this job we used a combination of old and new hardware. The new hardware we use however meets a high standard. 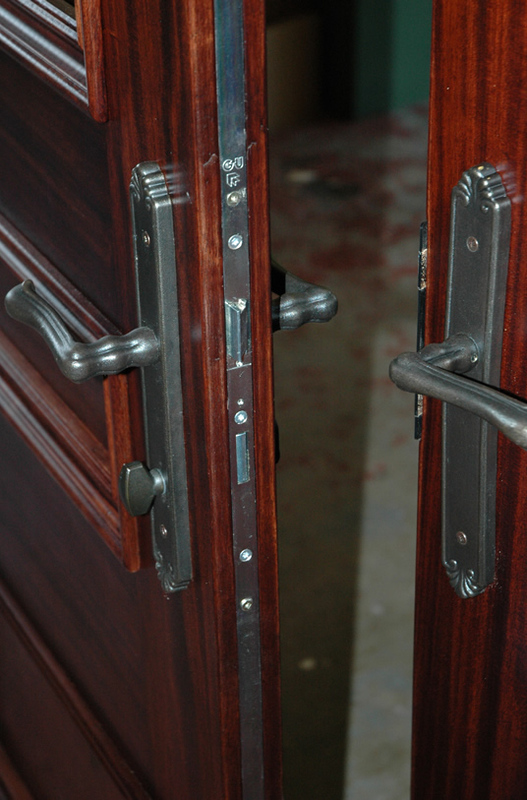 For instance, look at the design on the rusted and partially painted hinge and compare it to the new (very black) hinges. An excellent replica. 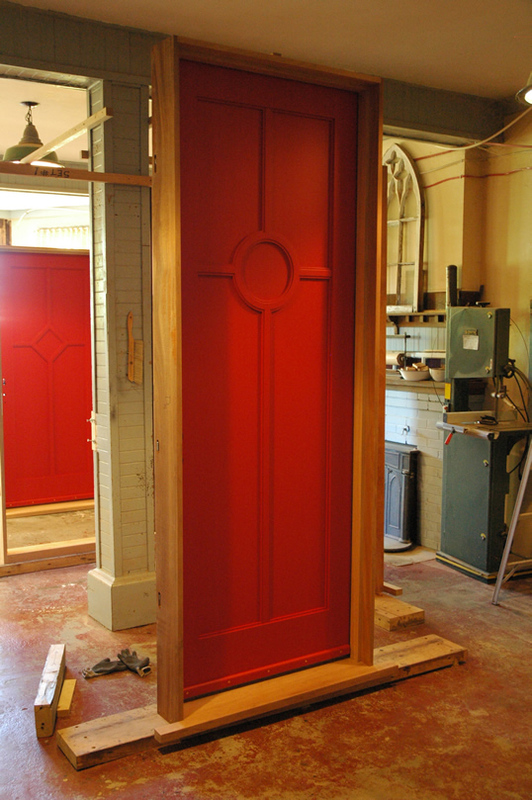 Once installed, these doors will look like they are the house's originals! 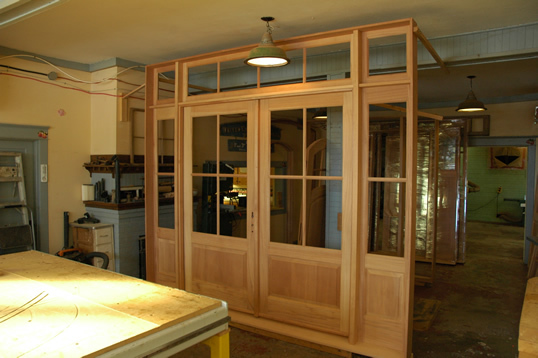 We also make custom period style screen doors. 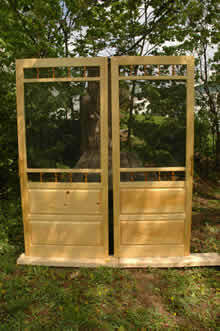 Here we have two raised panel screen doors. 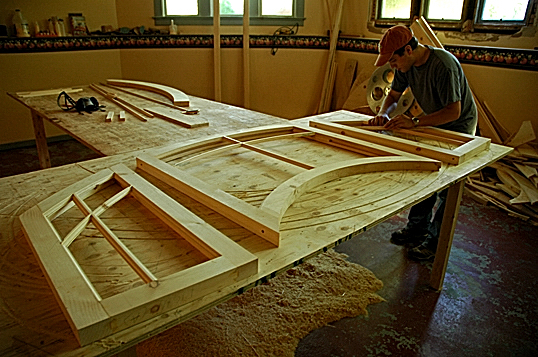 Note that the panels are not finger joined or buscuited - we use solid, single pieces of wood whenever possible. 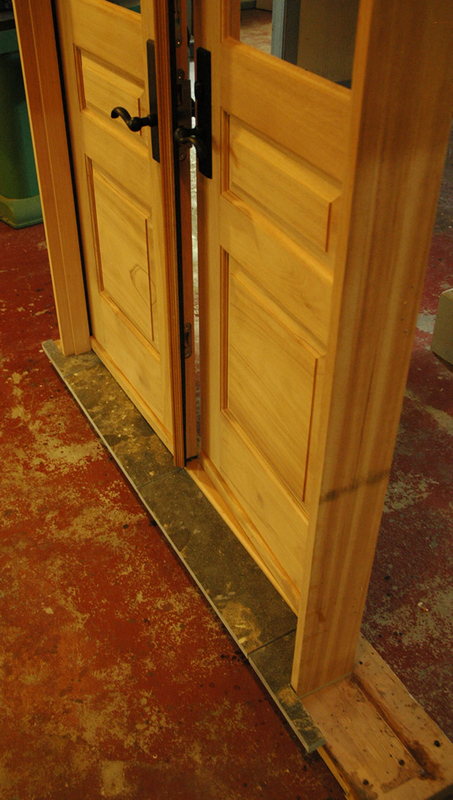 The last thing our customers want to see in their new door is a bunch of left over scrap wood glued together. 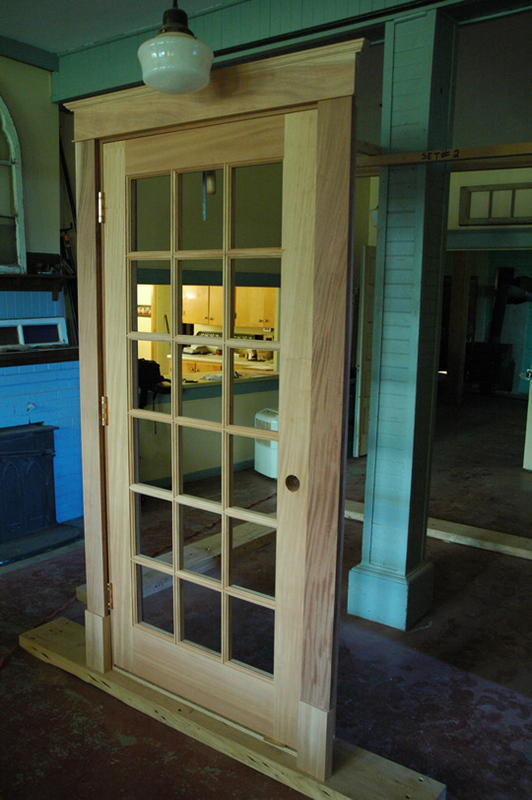 Matching front and back screen doors. Actually these are screen/storm combination doors in that the screen portion of the door pops out in the fall and a glass window of the same pattern takes its place thus becoming a storm door. 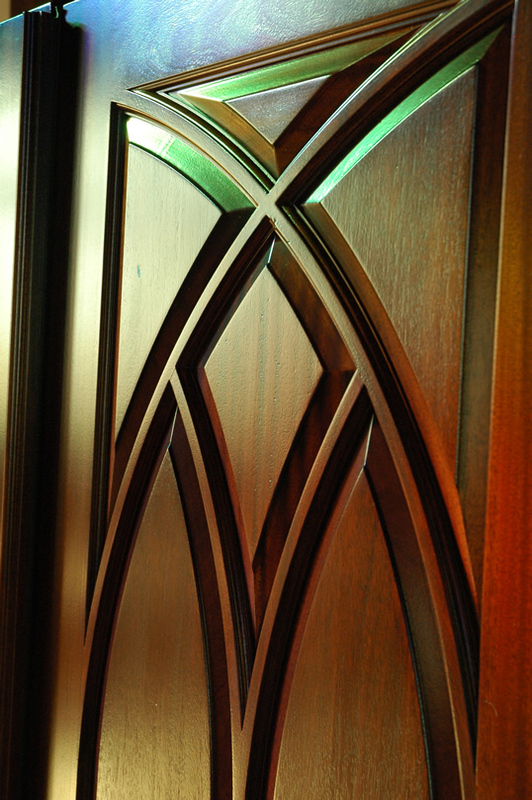 You will notice that much of our work are simplistic designs reminiscent of those from years past. Most of our customers are looking for something different. 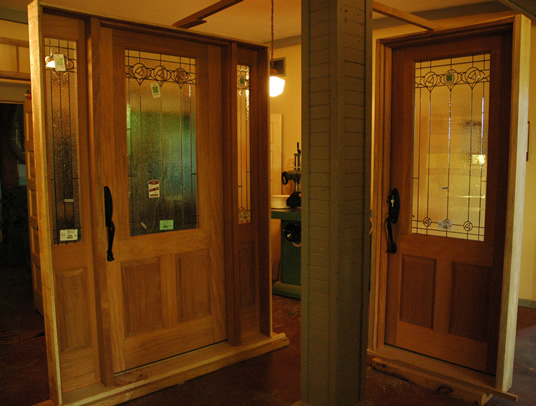 If they are not replicating an existing door for their period home then its usually a picture they have seen in a magazine and really liked it. The above picture is testimony to this. 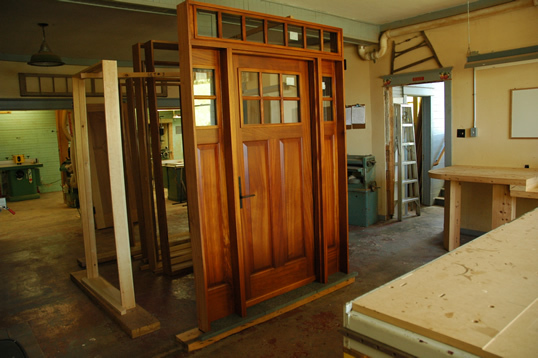 Here we are building 15 interior doors, the tall ones being 8 feet high with glass in the top - isn't this a refreshing concept! One does need 9 - 10 foot ceilings however. 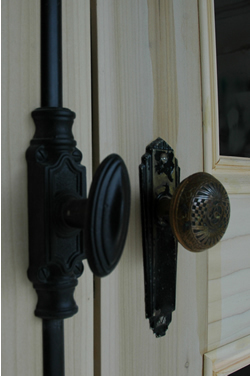 The pieces in the fore-ground are the components of the doors shown... Like our sash they are built in the traditional manner of rails, stiles and mullions, all of which are assembled using pegged mortise and tenon joinery. Beautiful! 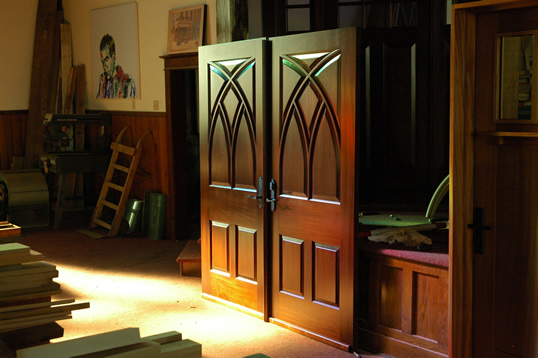 (CLICK HERE for close-up images of these doors installed). 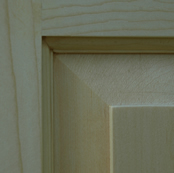 Just a note on the wood we use for the making of our doors... Look at the orientation of the growth rings in the end grain of this door stile. Do you notice how the grain is running the thickness of the stile instead of the width? This is called 'rift-sawn' wood as opposed to 'flat-sawn'. Wood mills no longer mill this way as it is not economically efficient for them - flat-sawn is the cheaper route. 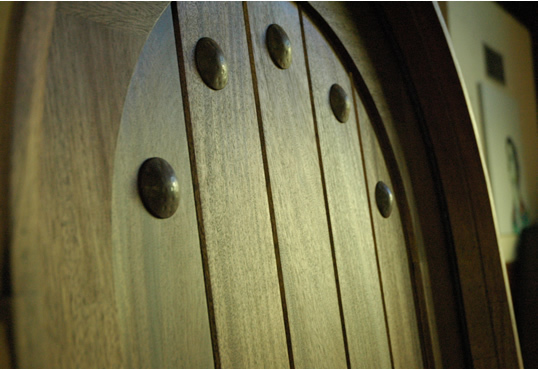 We search high and low for this type of wood for all our doors as it is the most stable in terms of door warpage and 'cupping'. 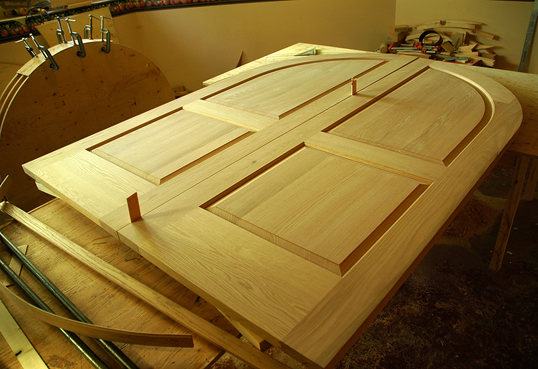 Doors (especially exterior) made with flat-sawn lumber will not stand the test of time!